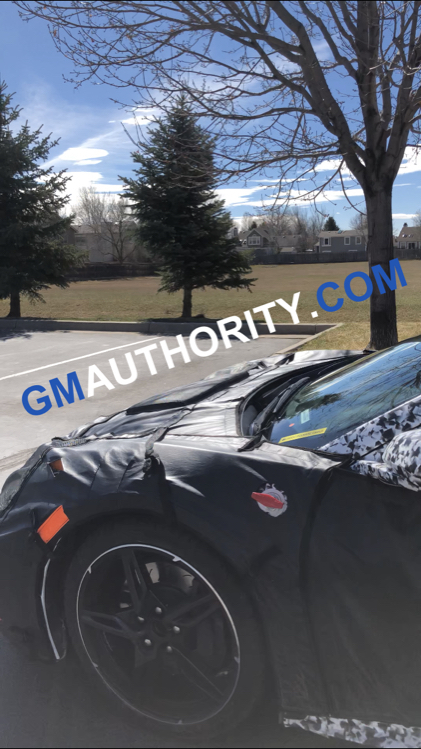 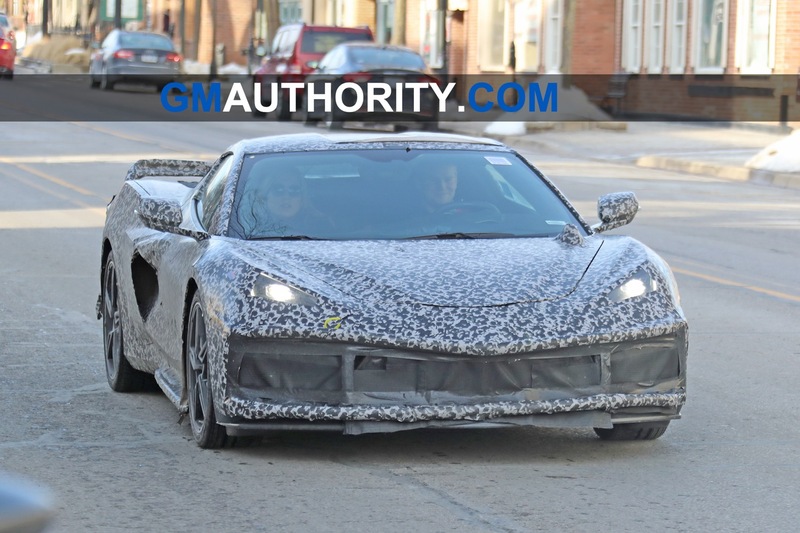 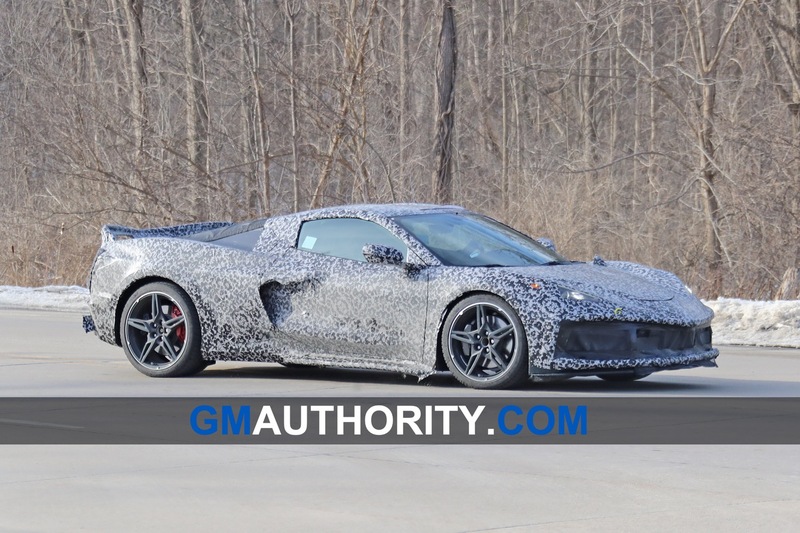 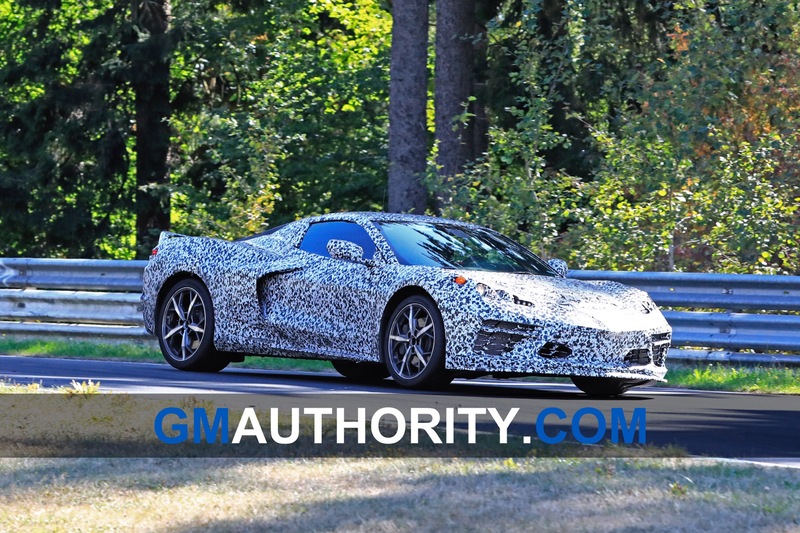 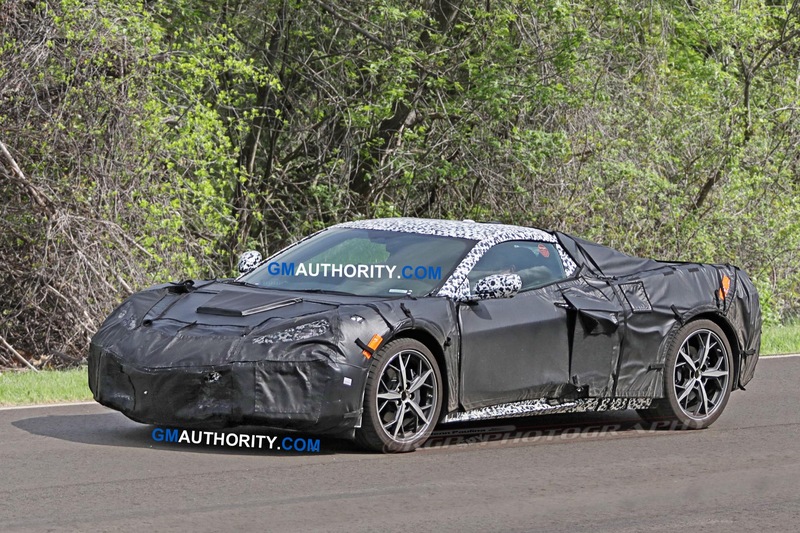 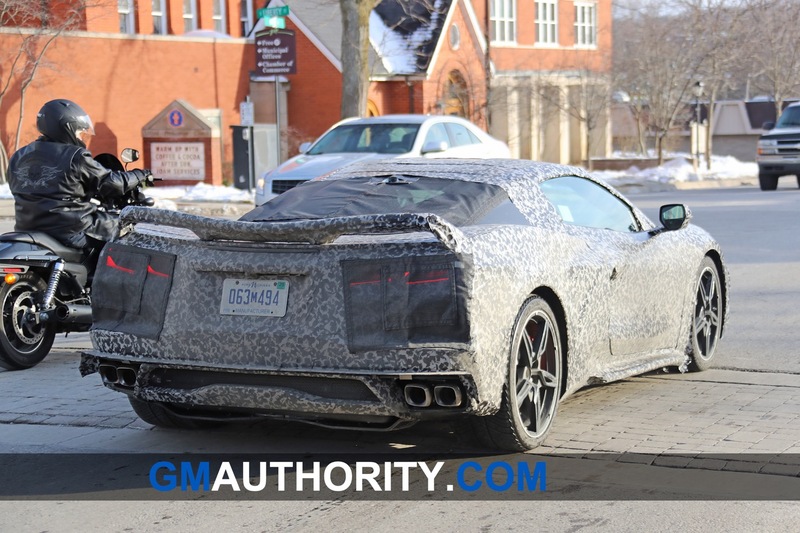 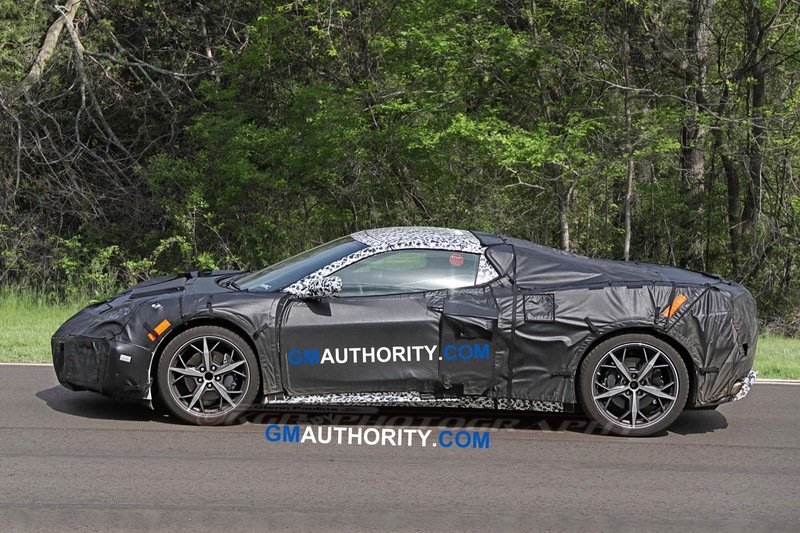 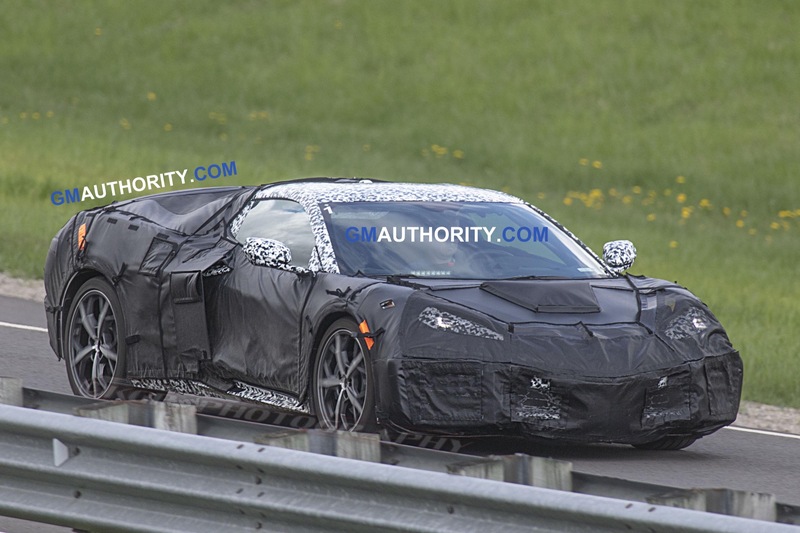 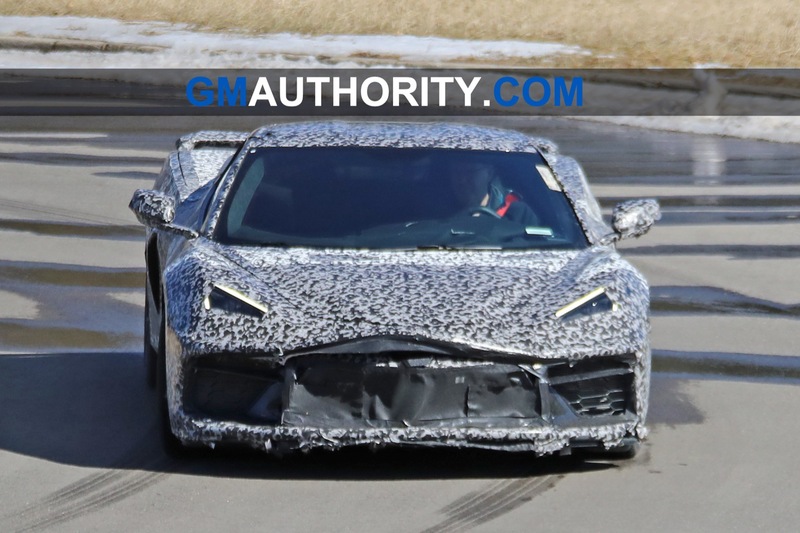 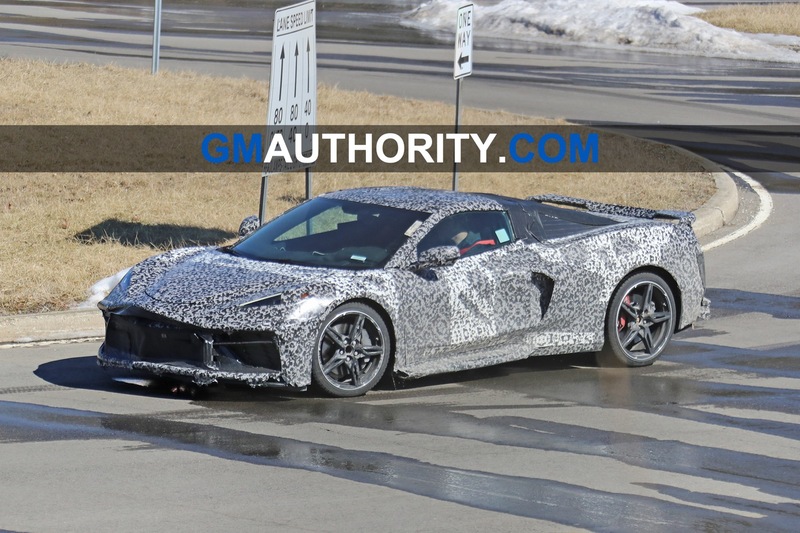 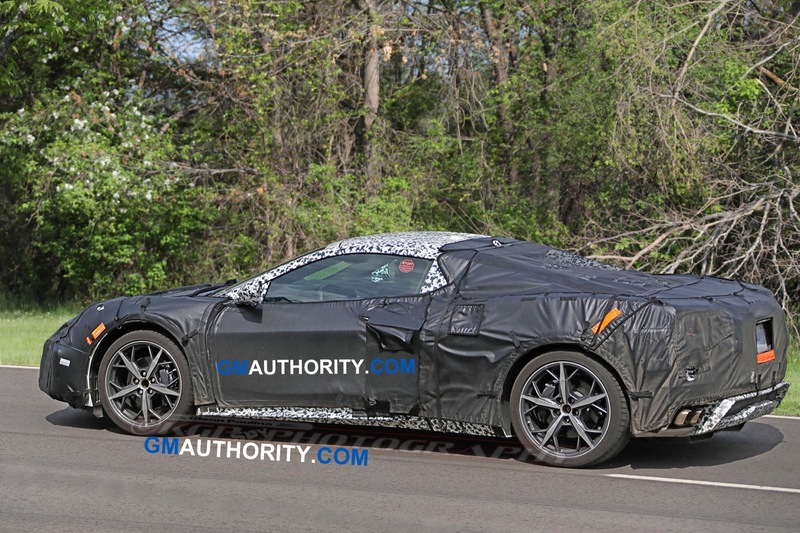 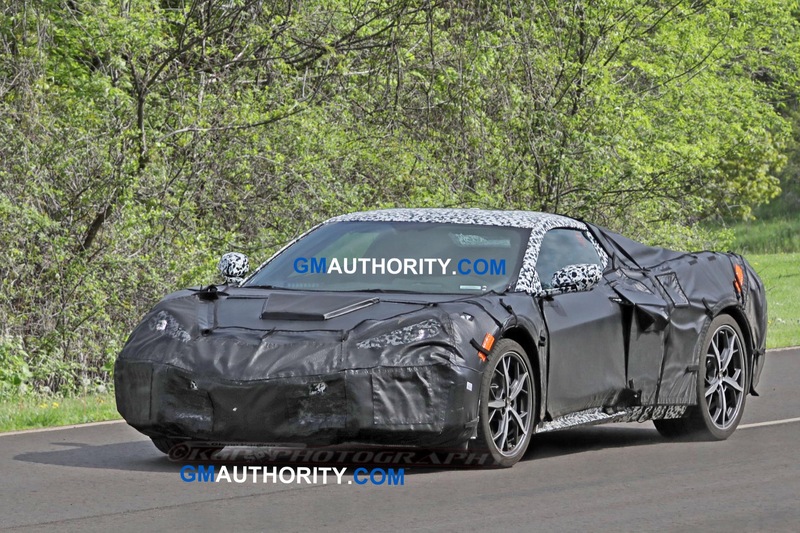 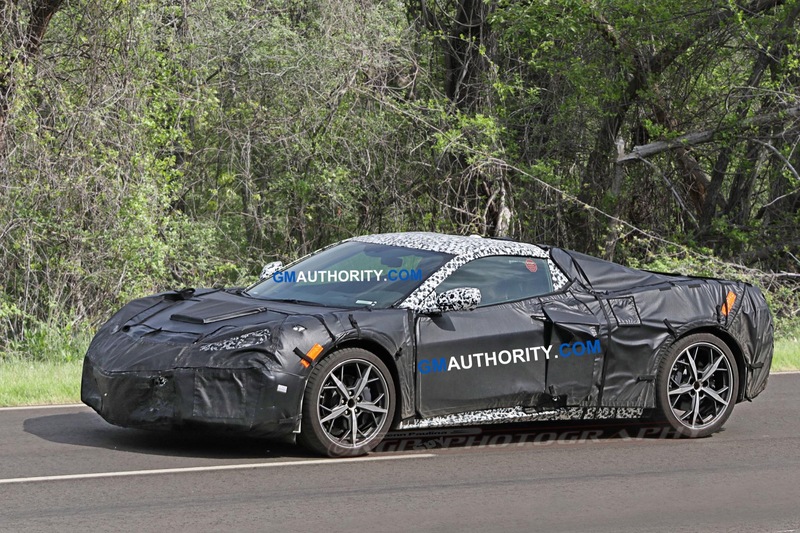 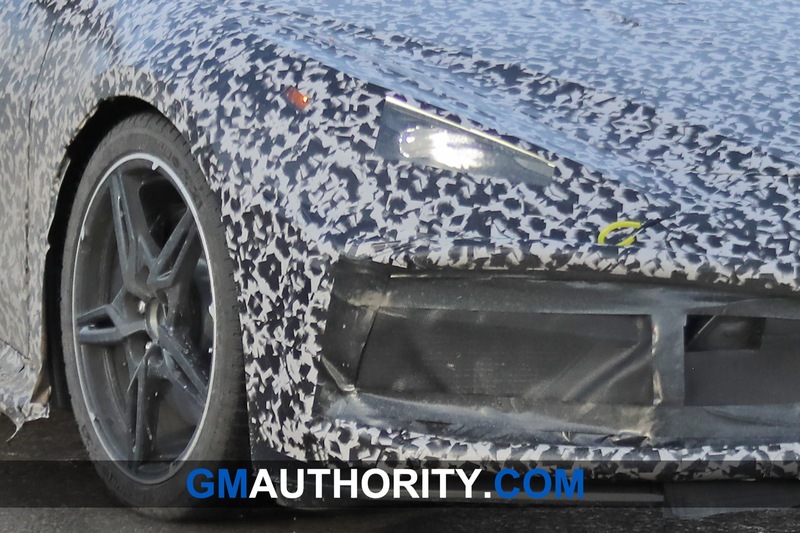 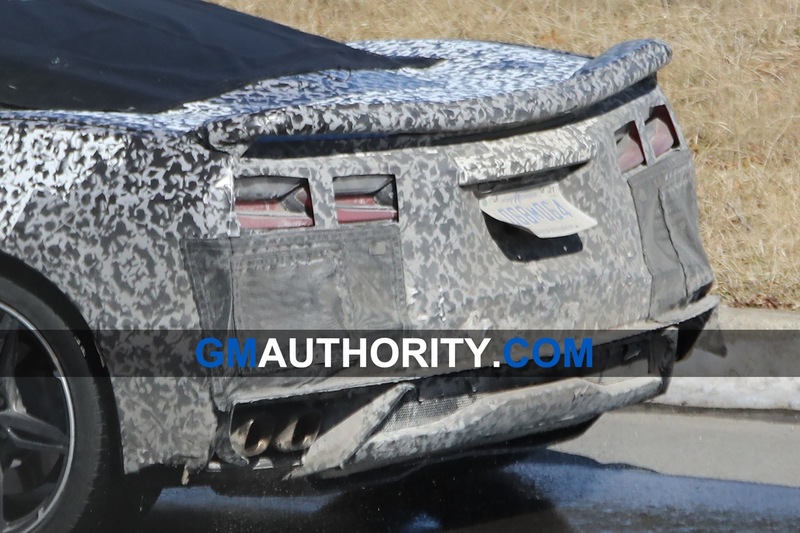 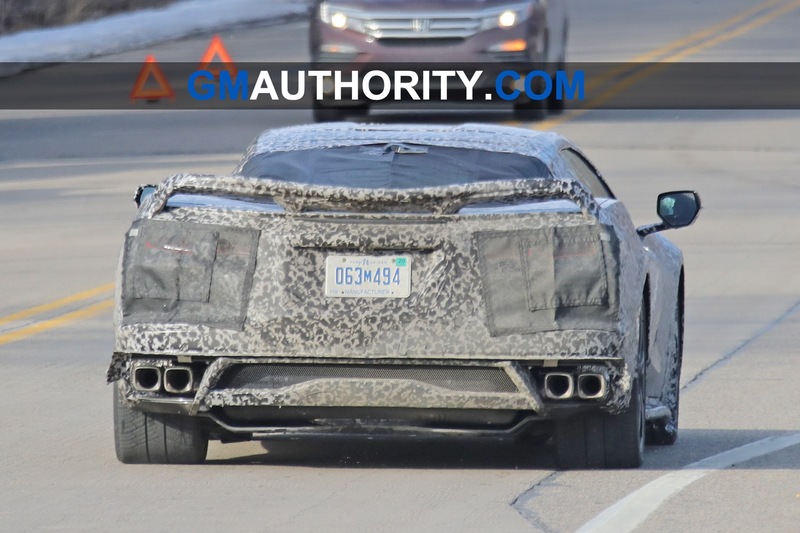 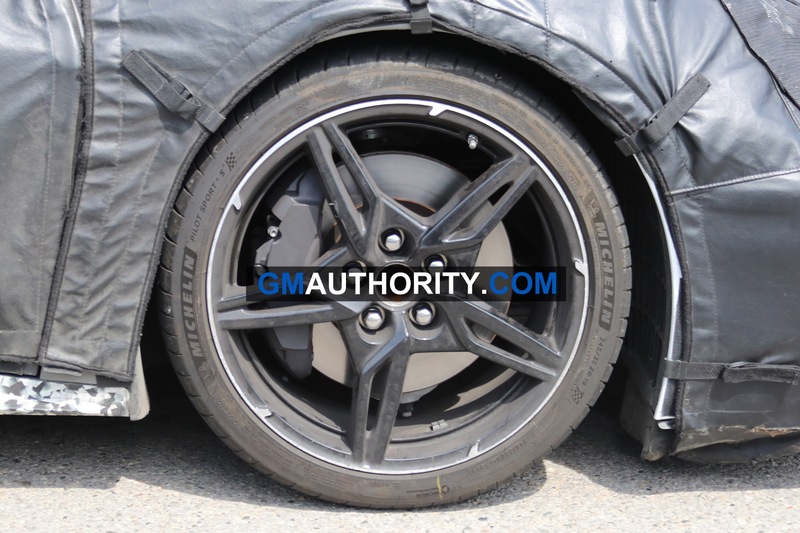 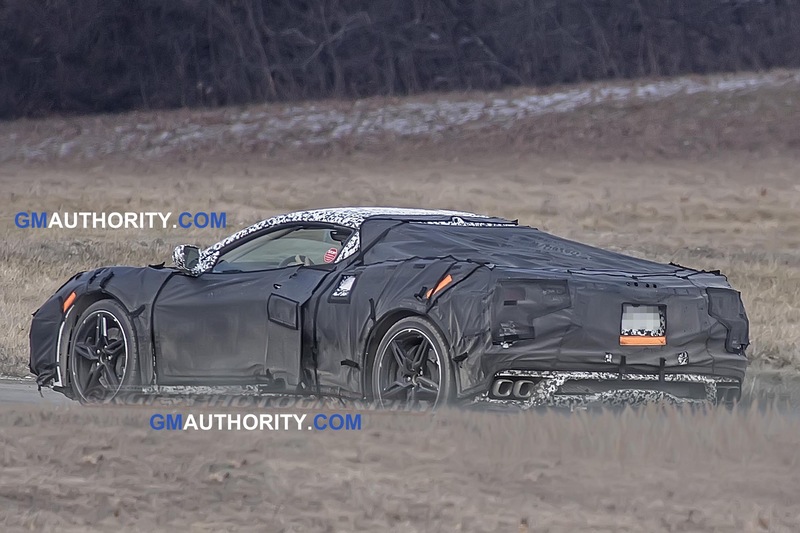 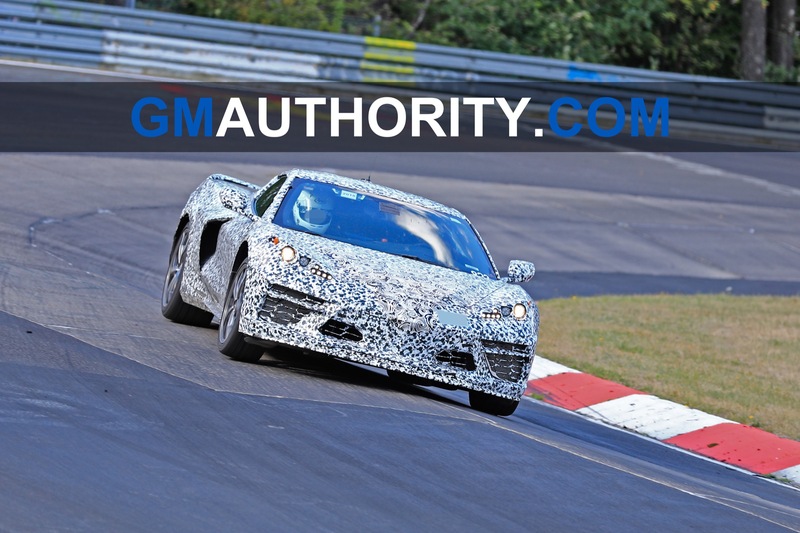 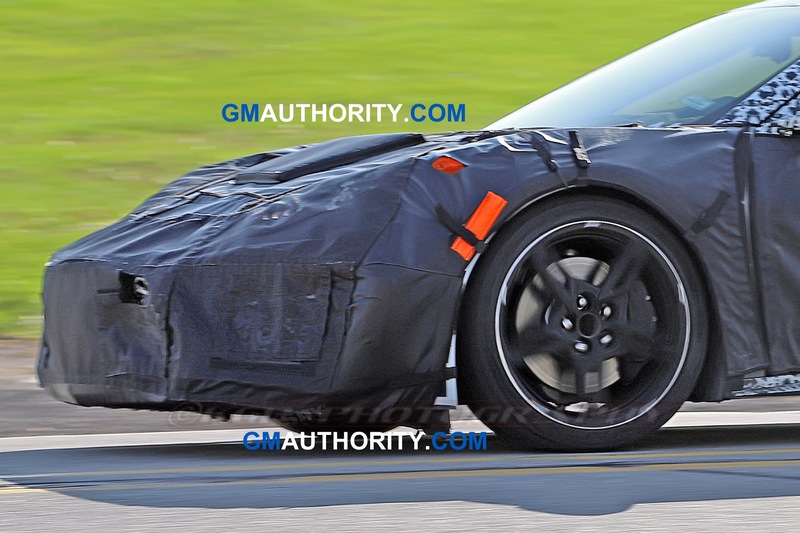 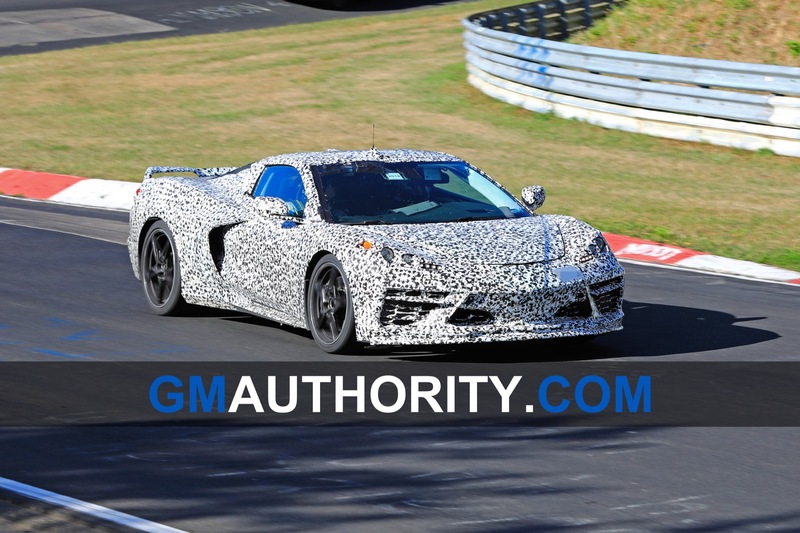 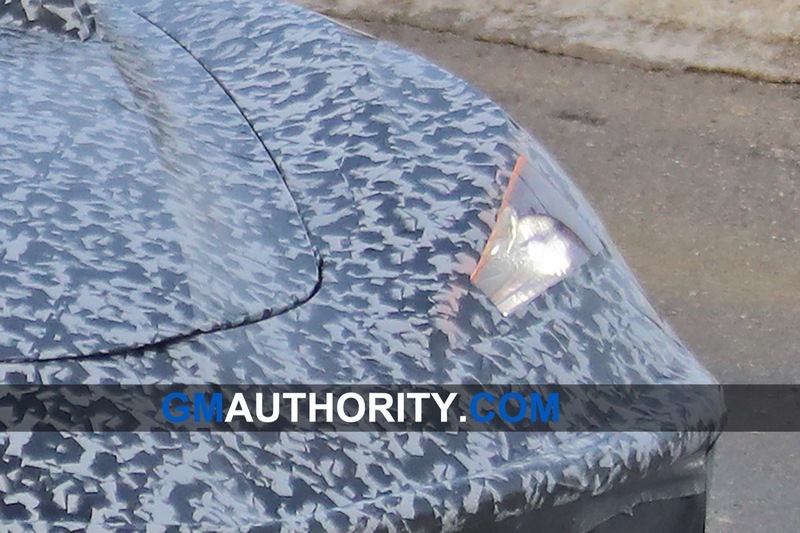 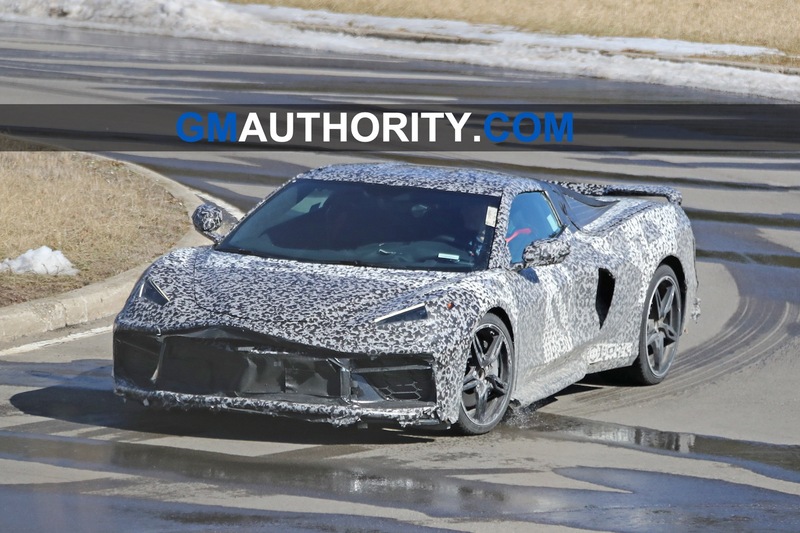 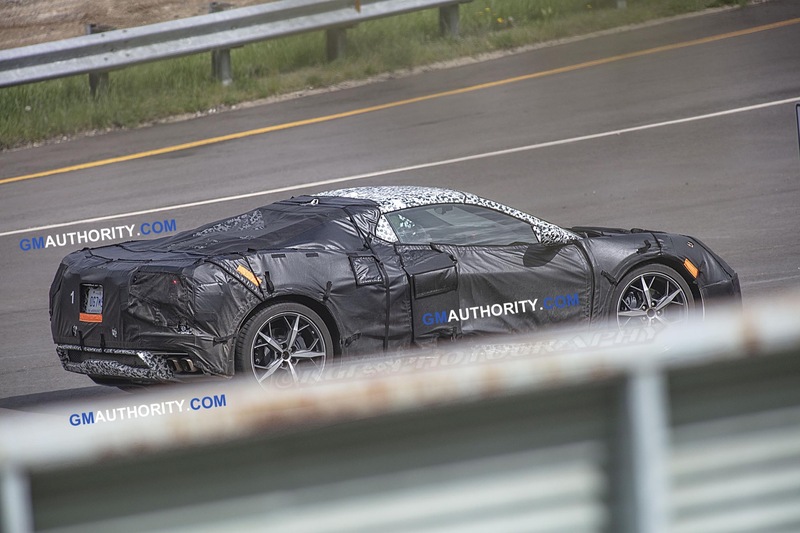 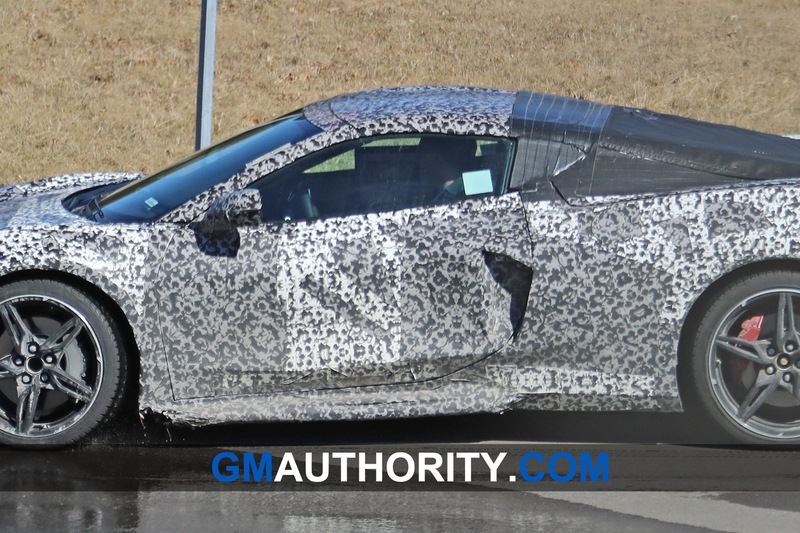 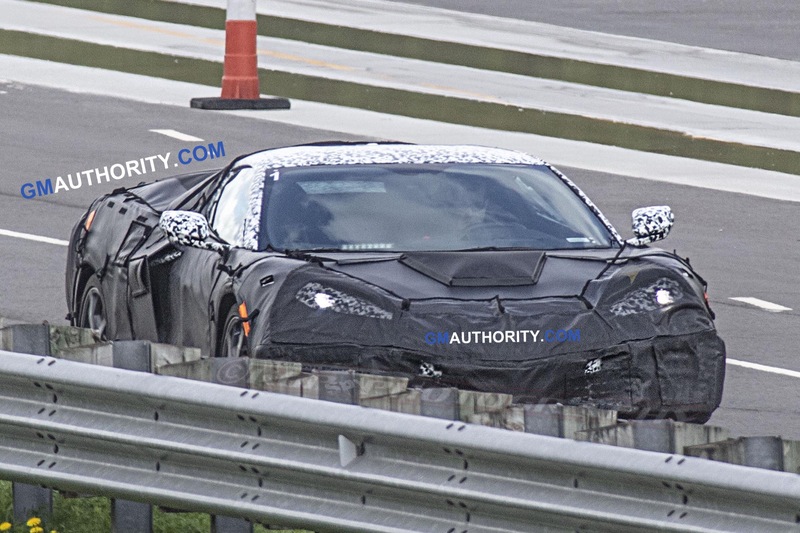 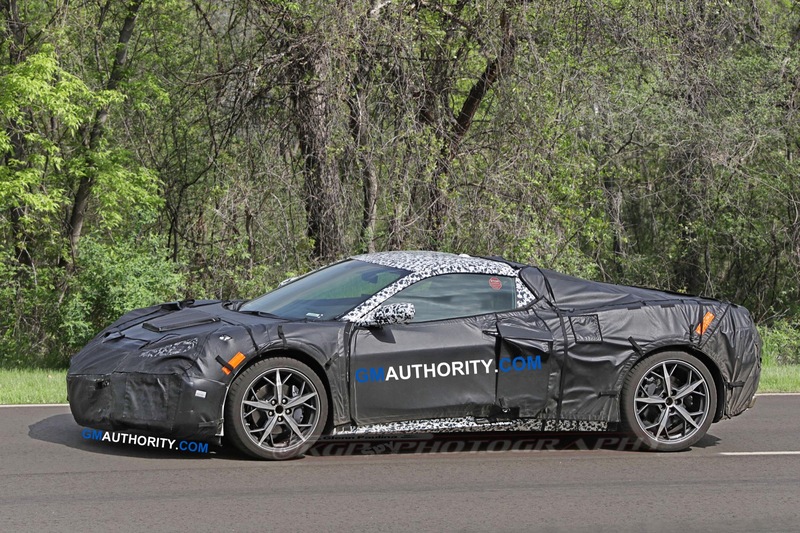 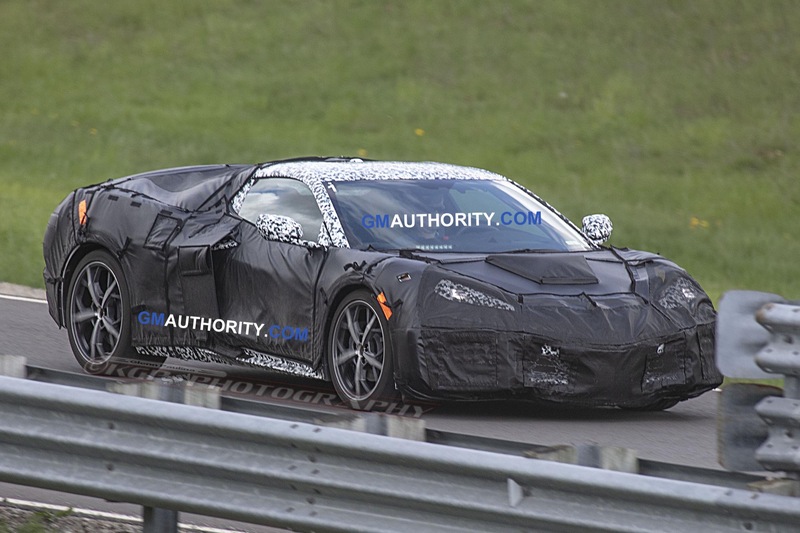 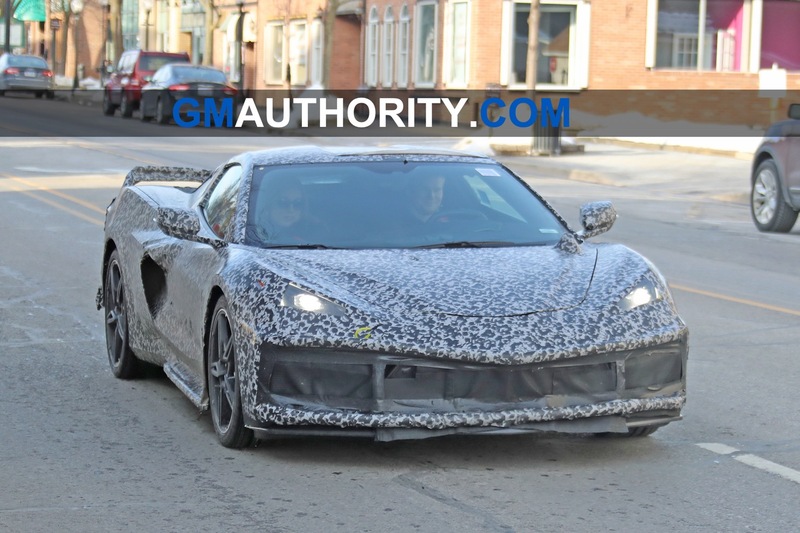 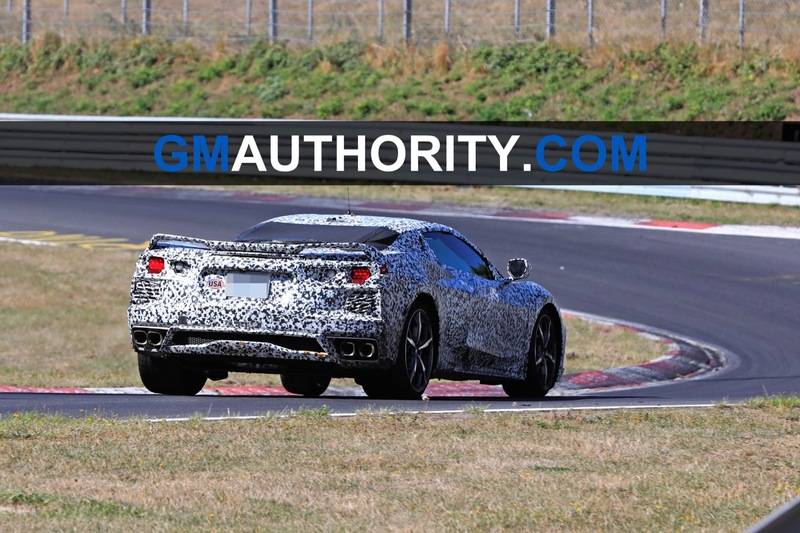 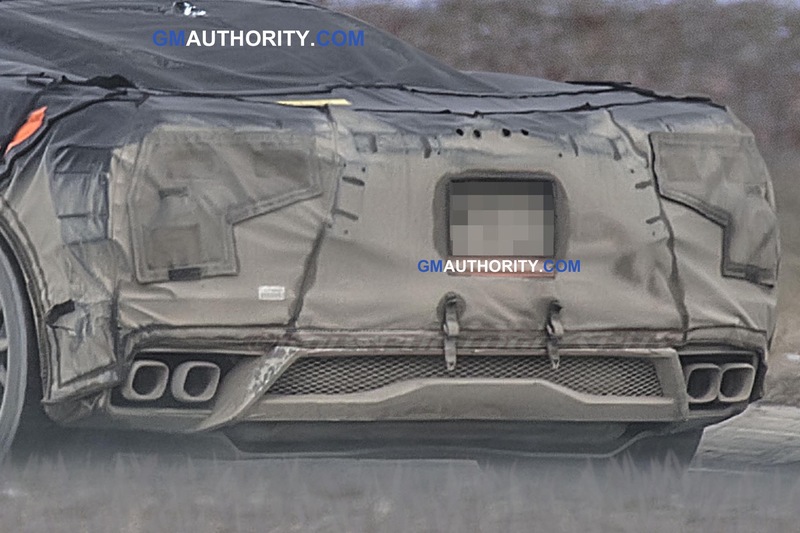 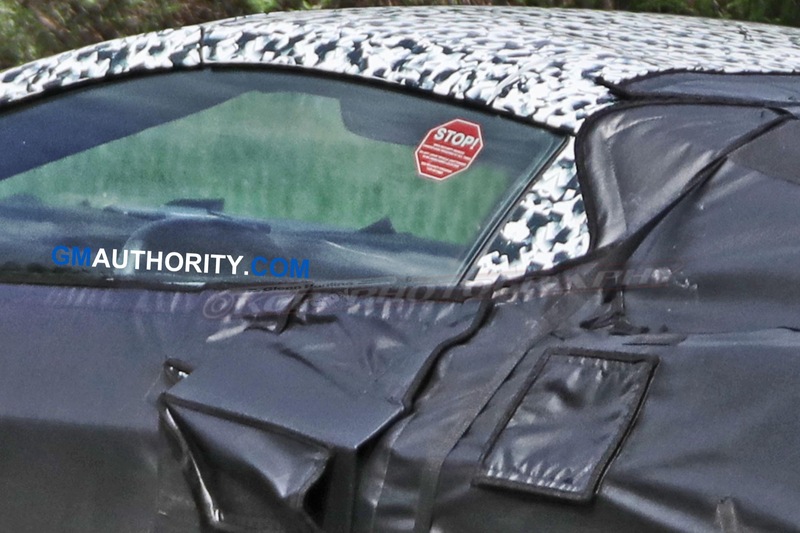 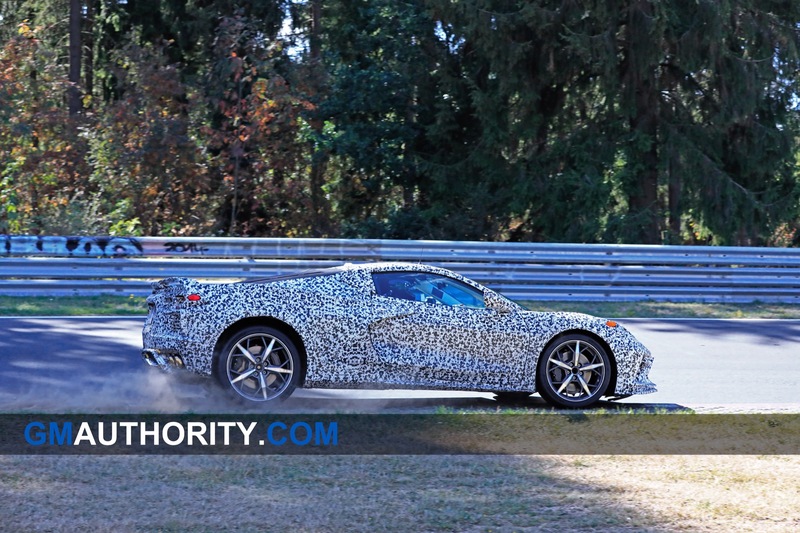 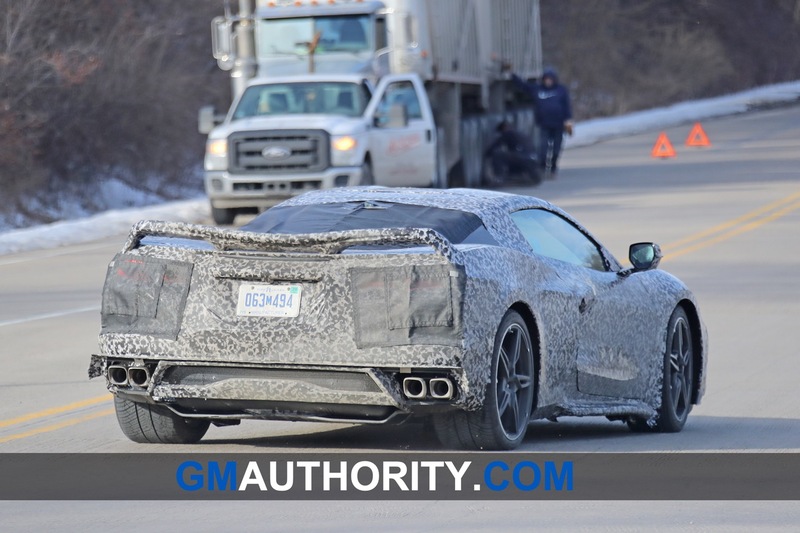 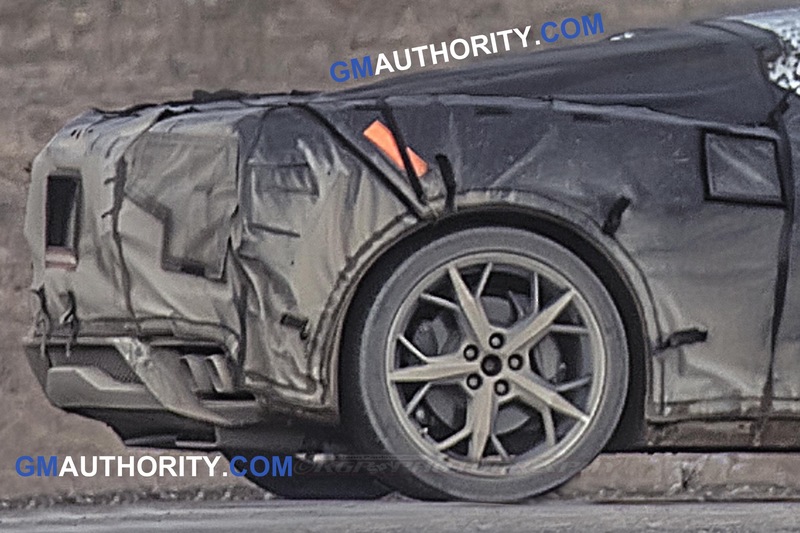 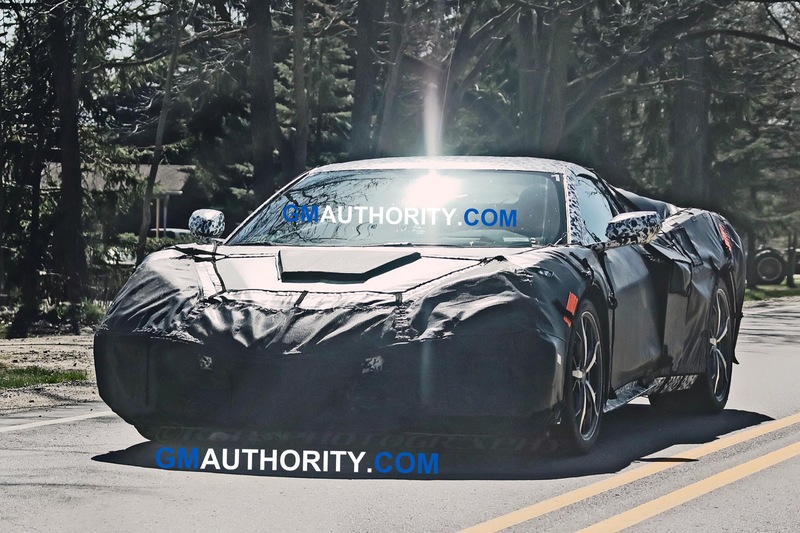 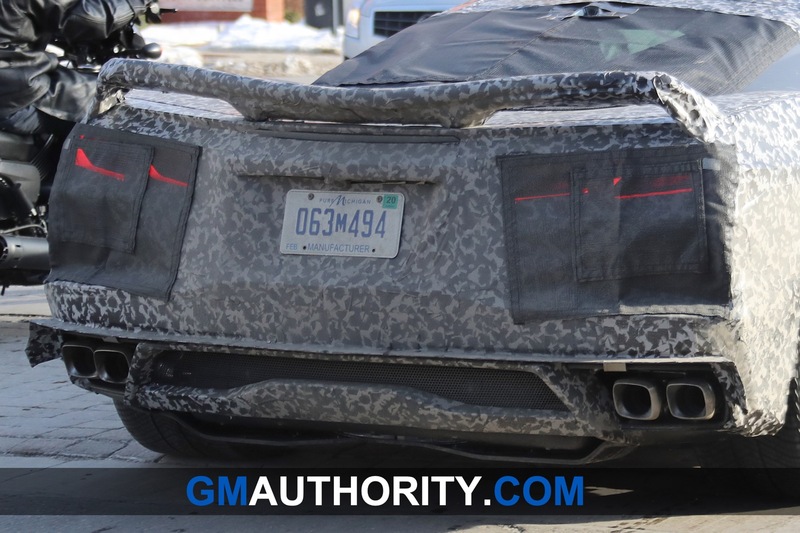 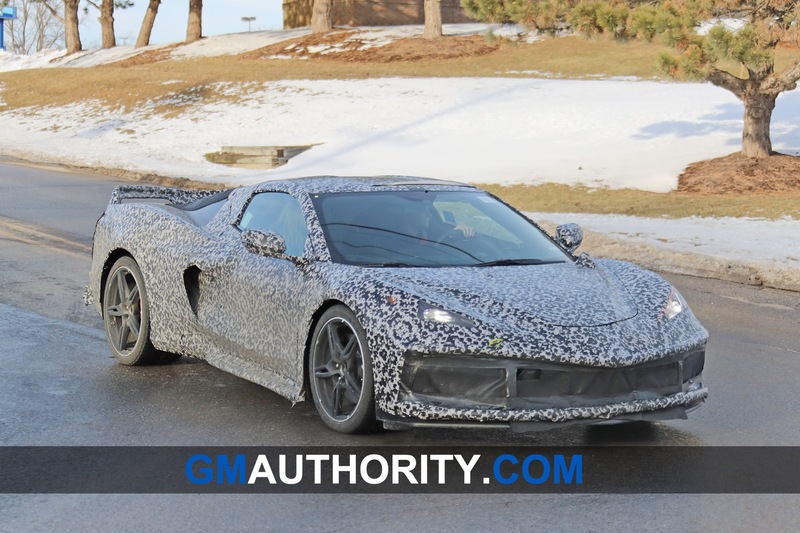 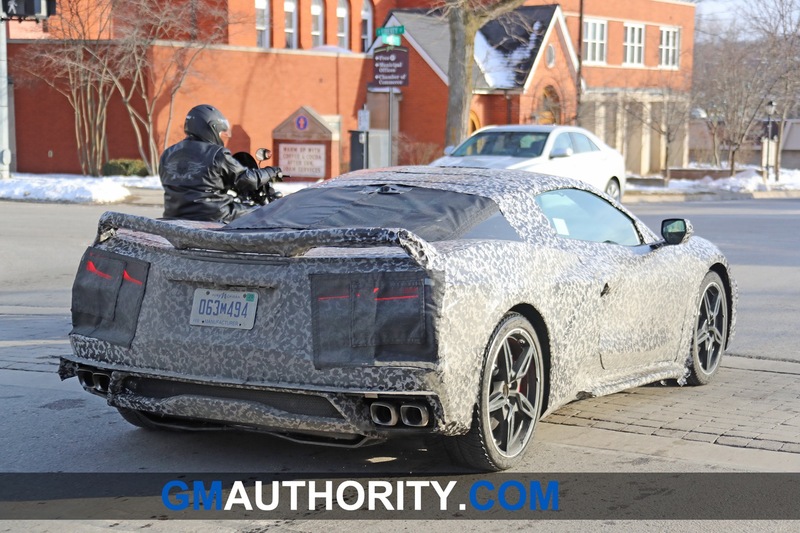 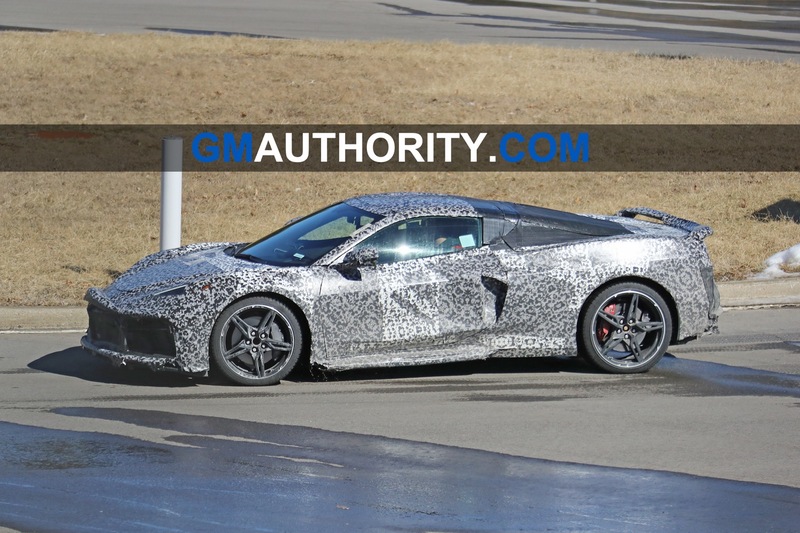 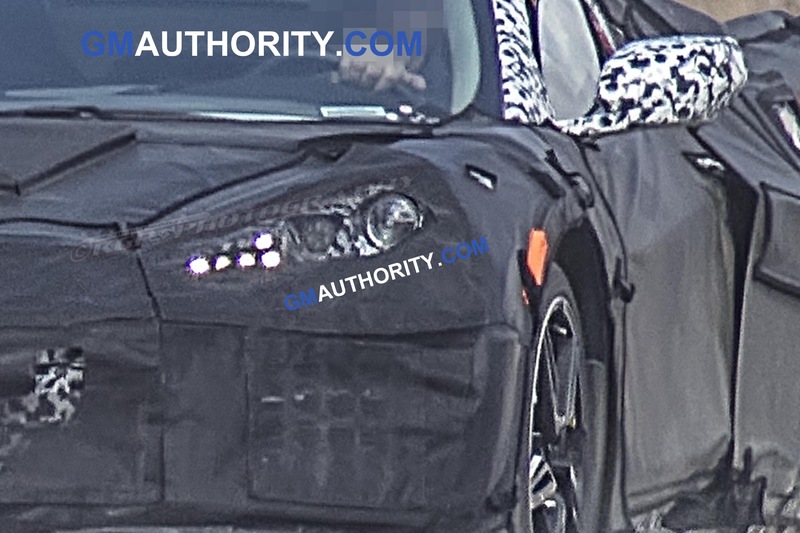 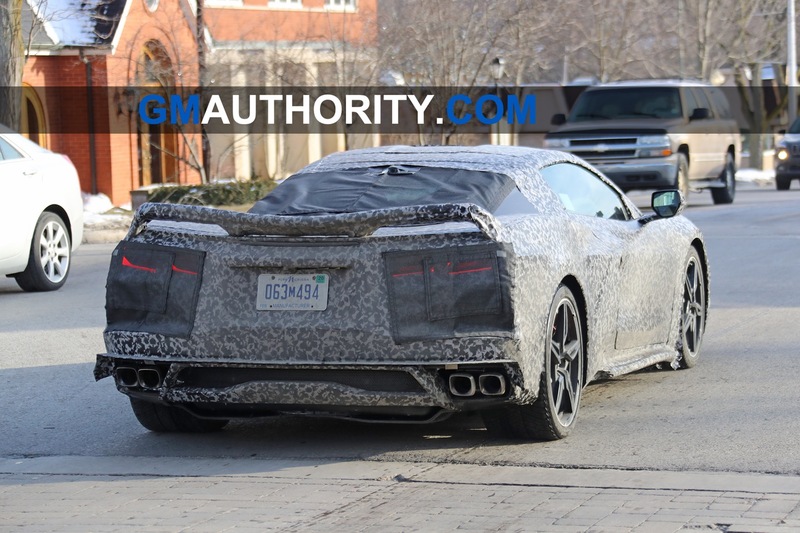 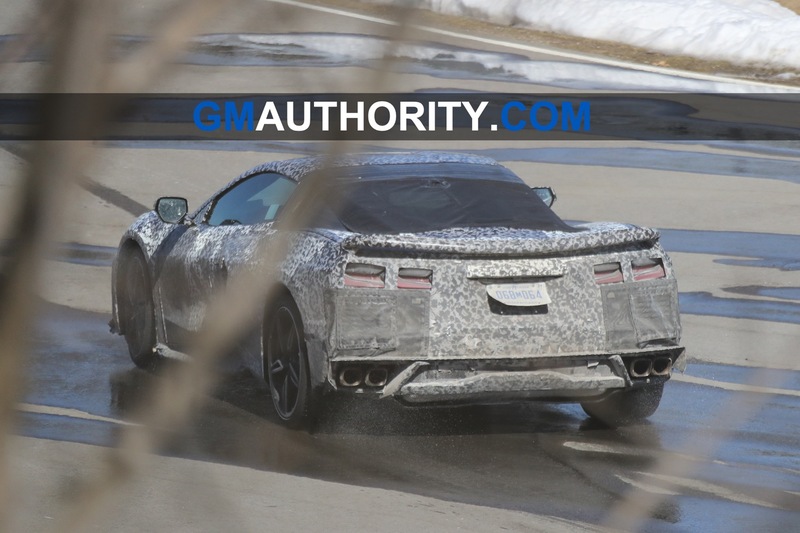 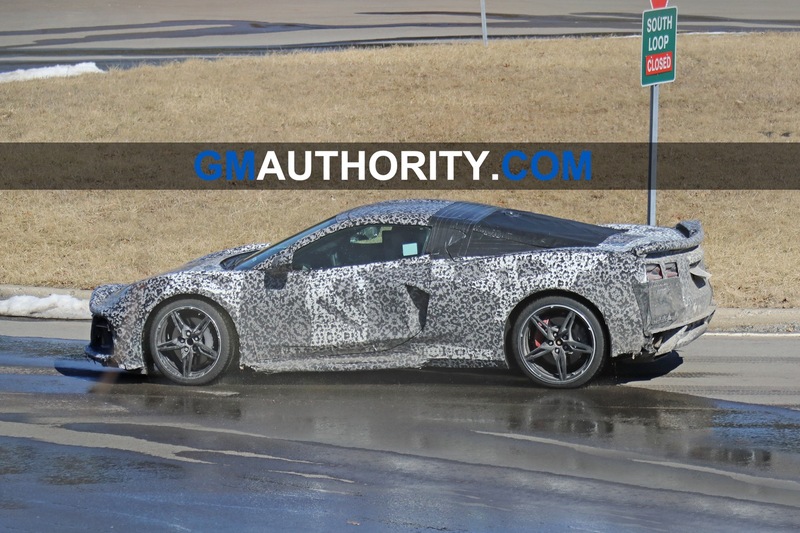 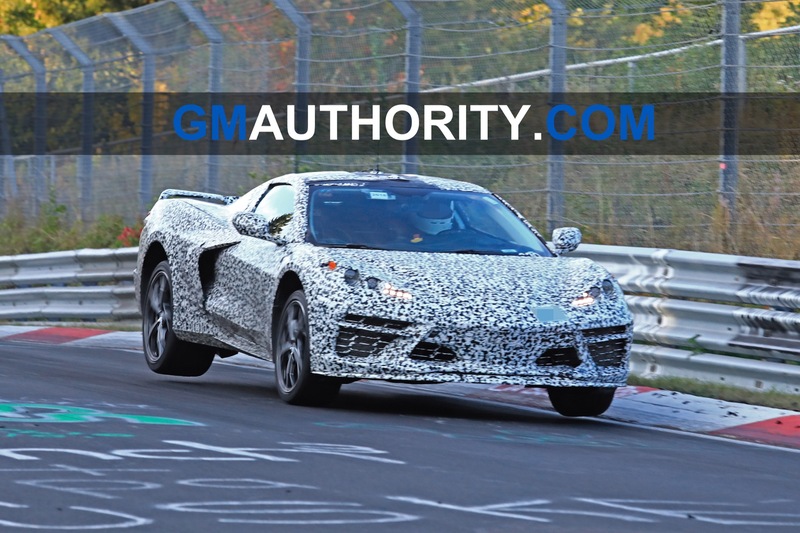 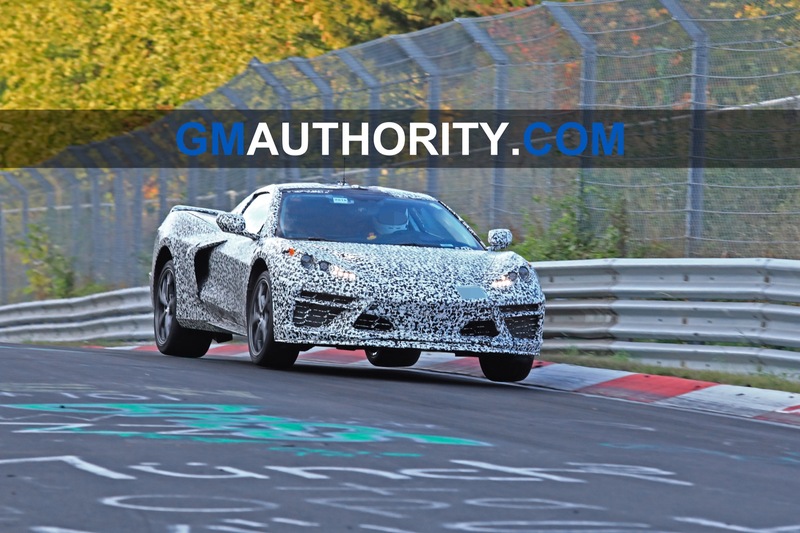 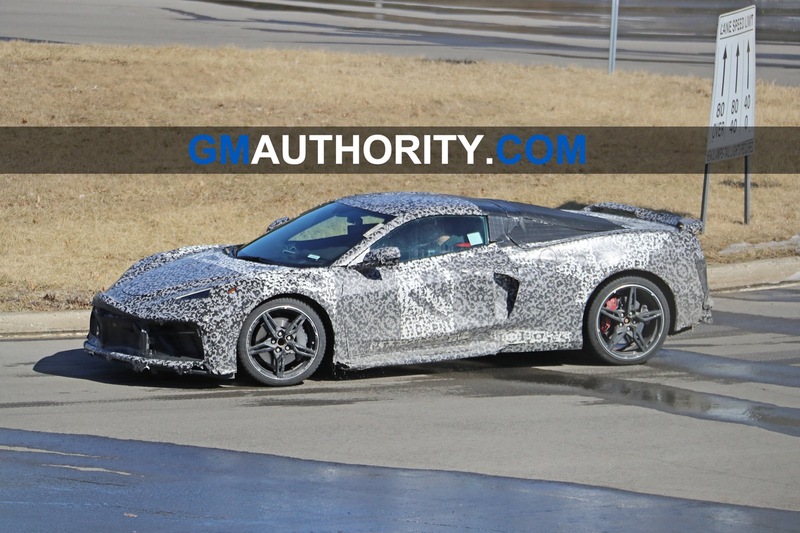 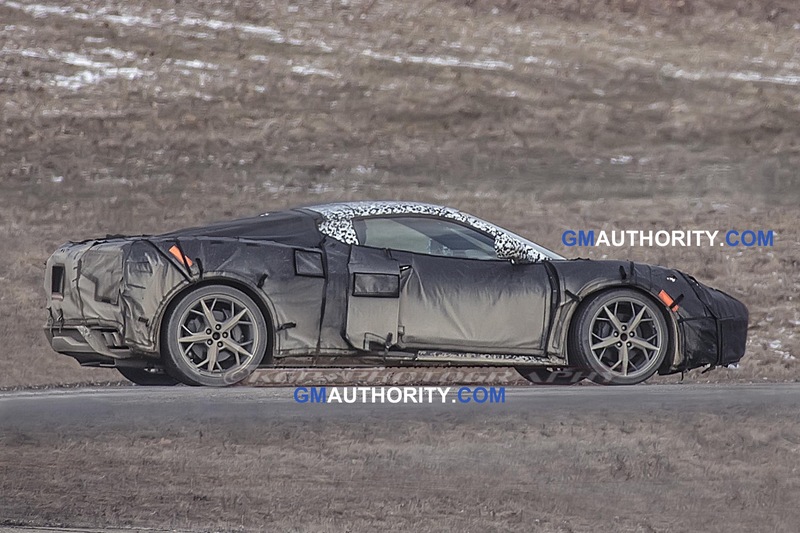 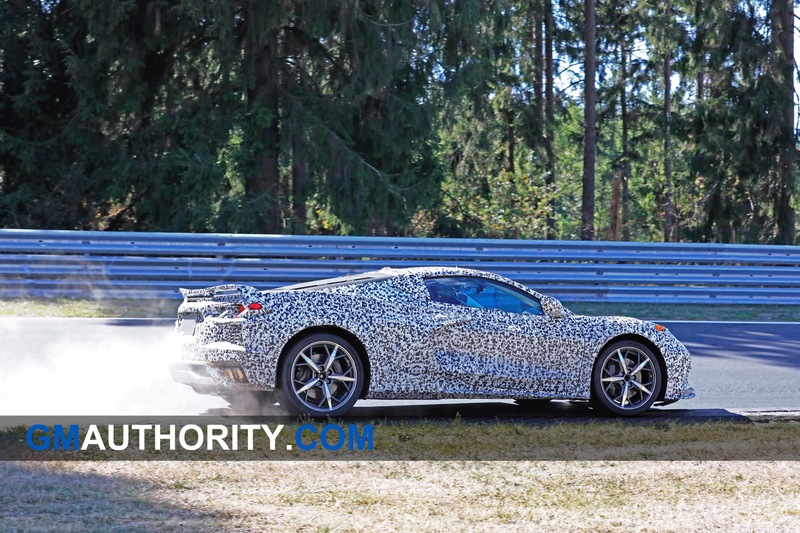 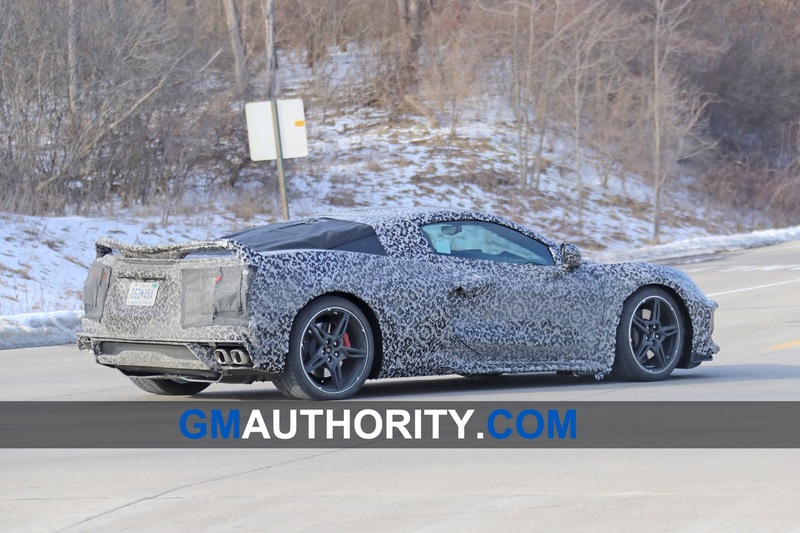 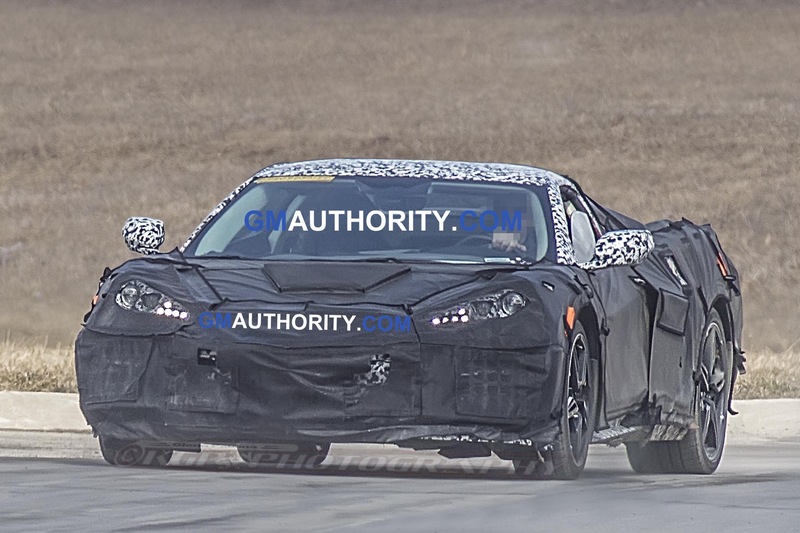 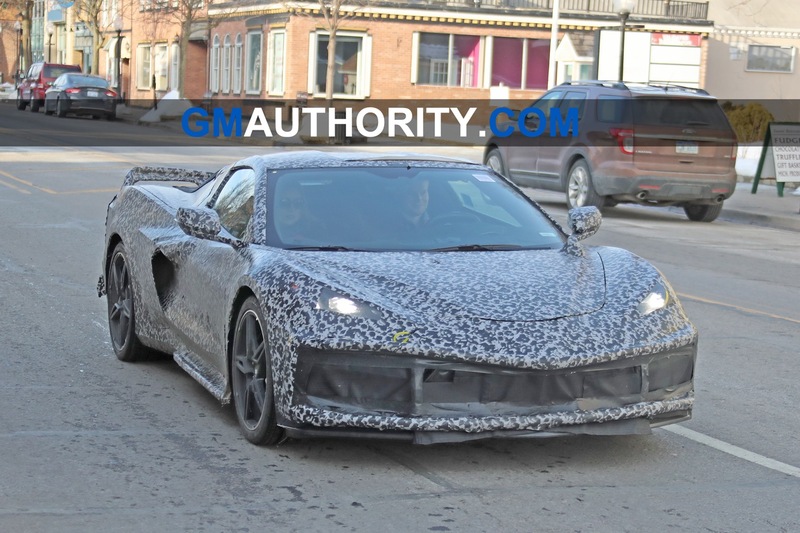 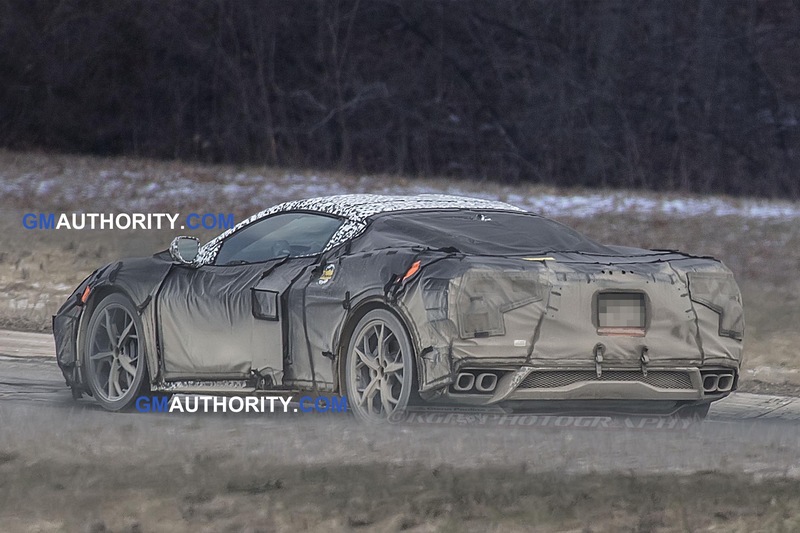 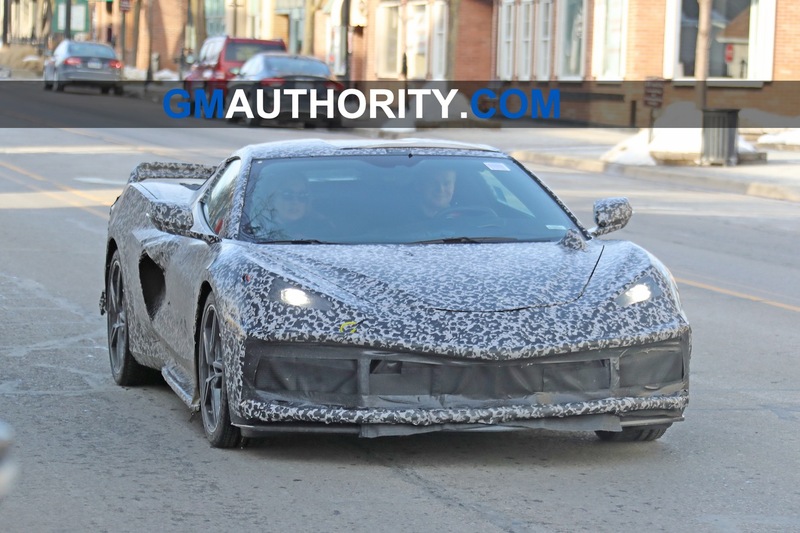 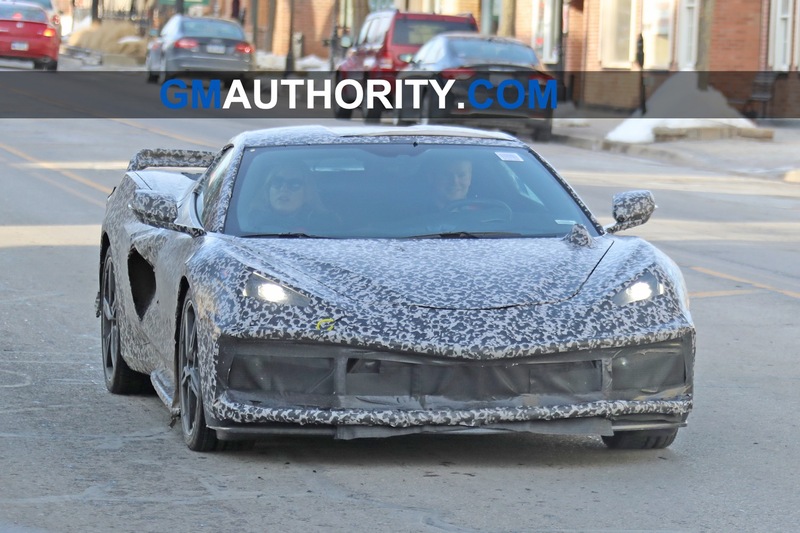 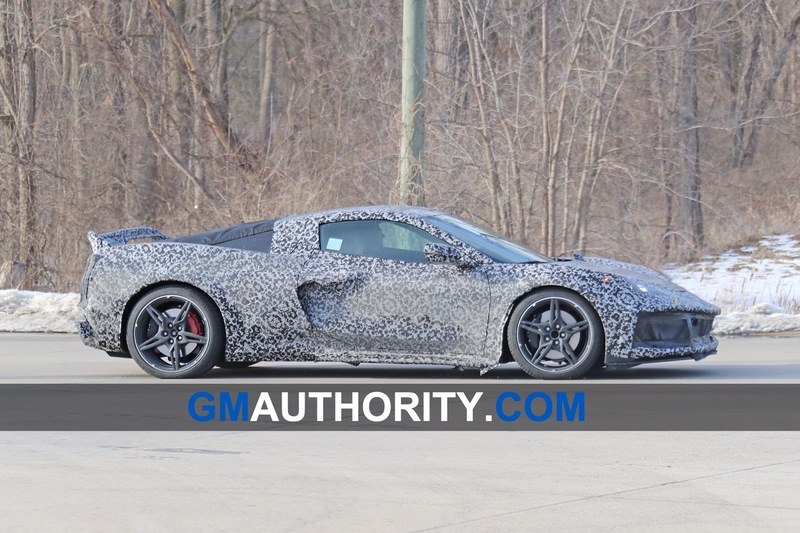 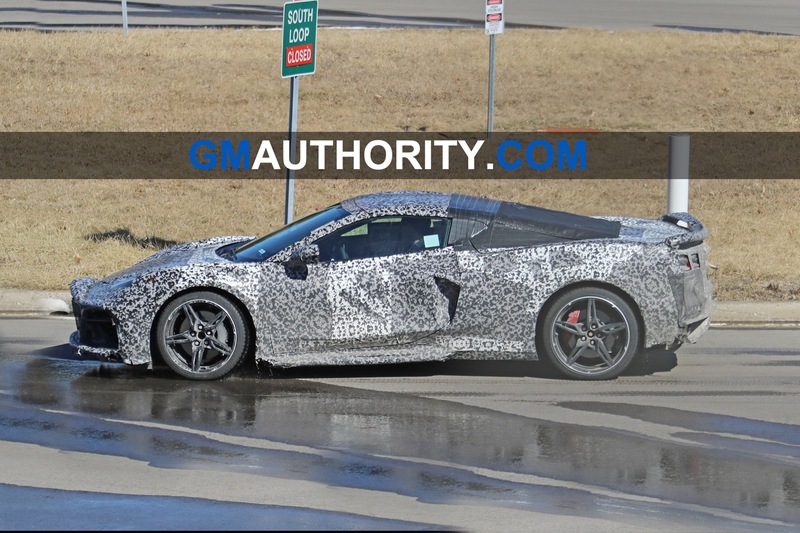 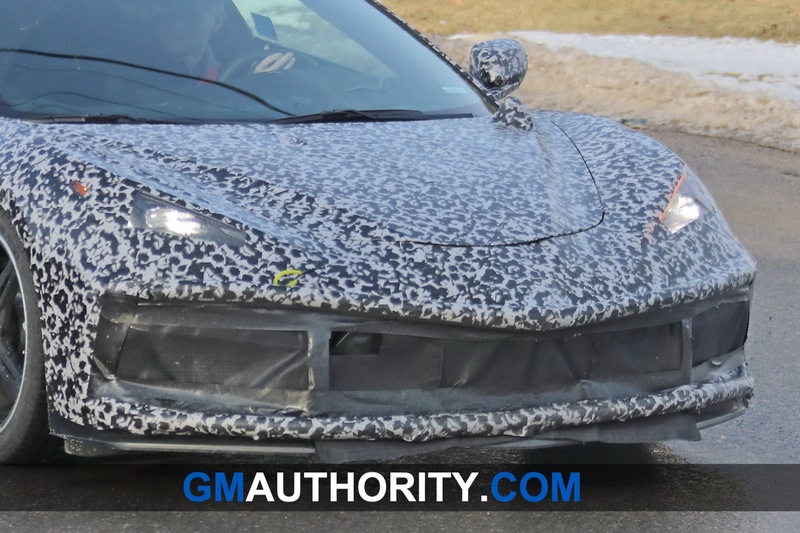 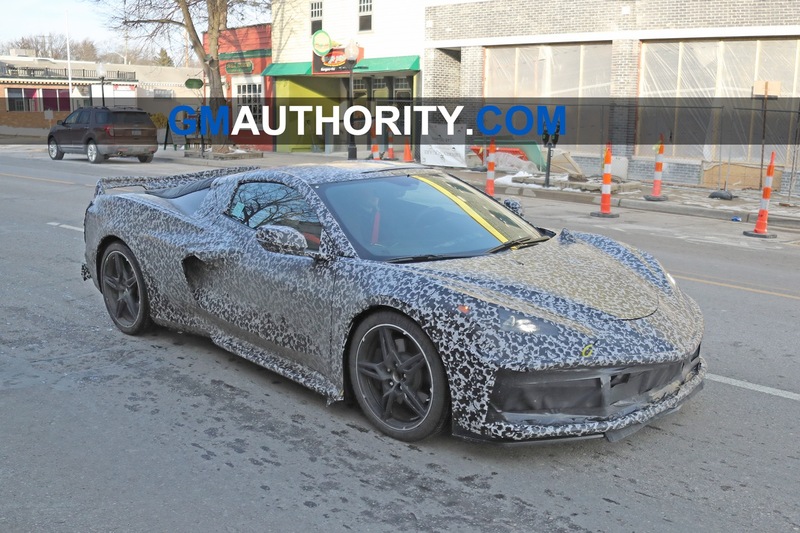 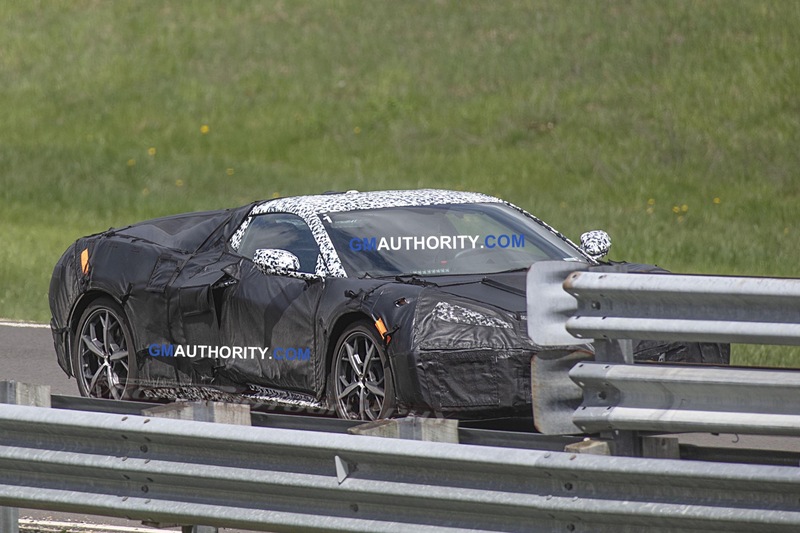 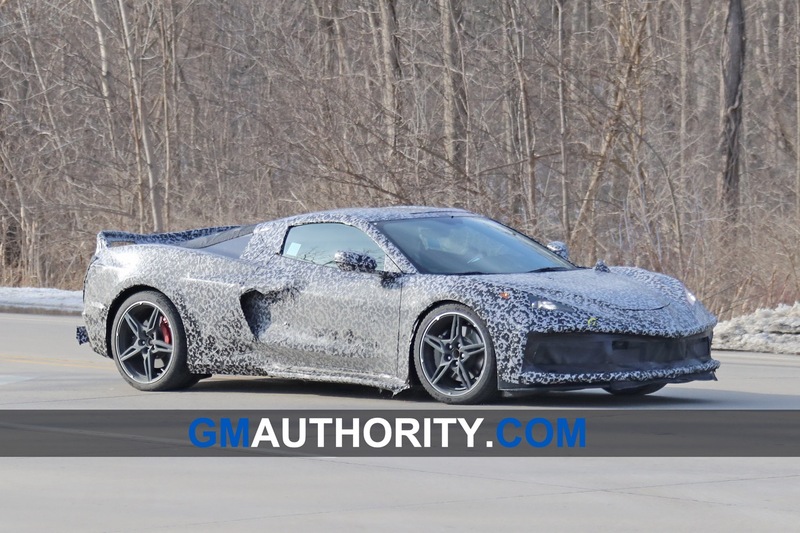 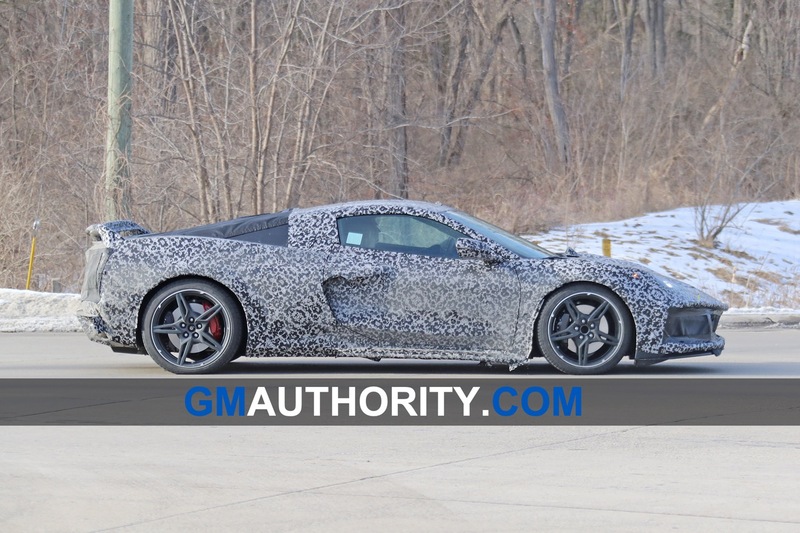 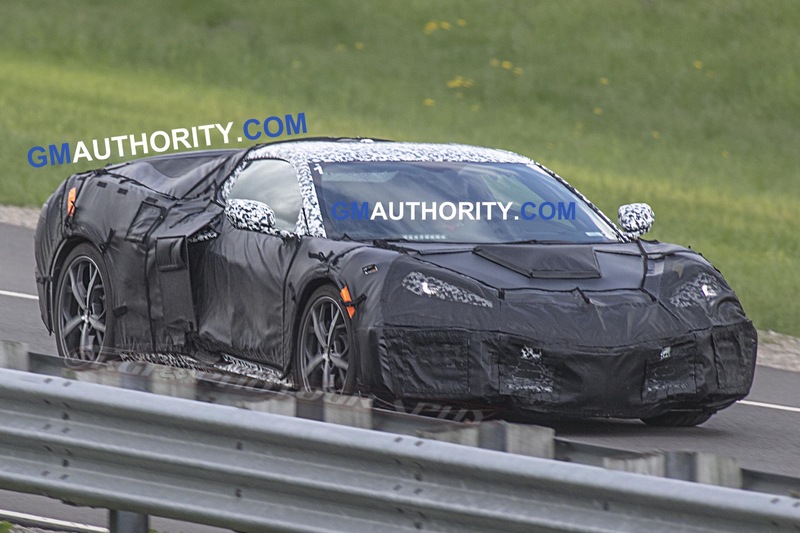 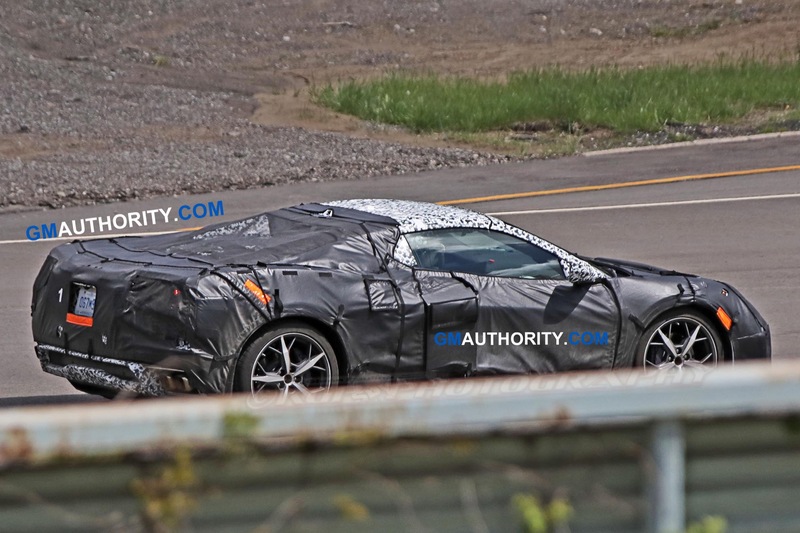 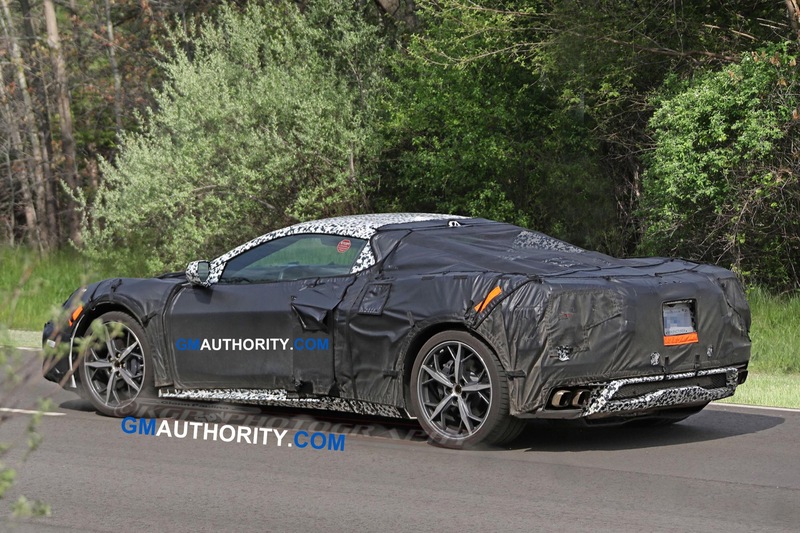 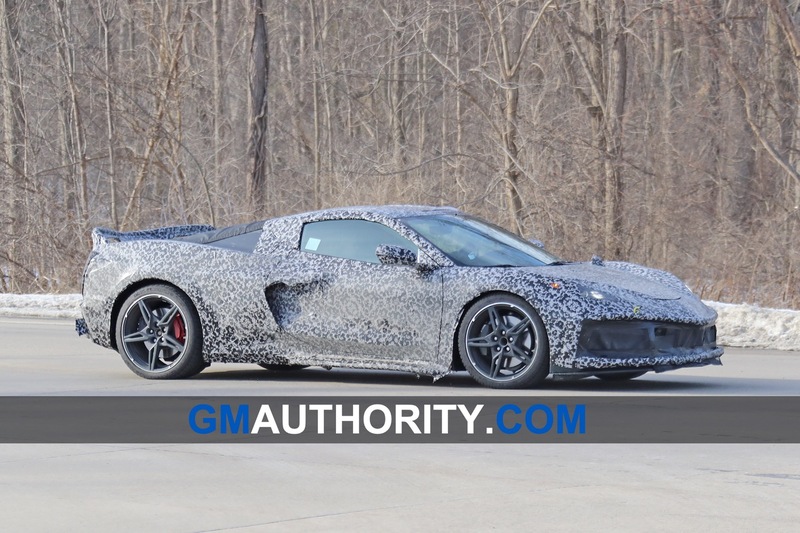 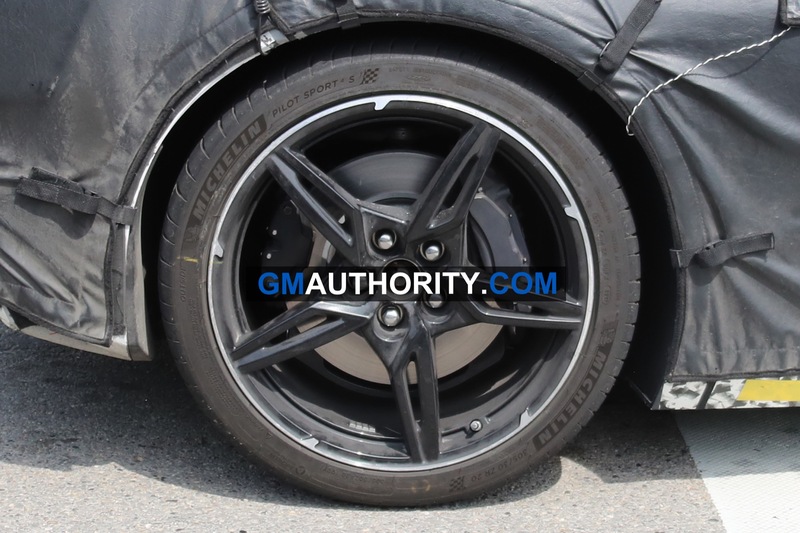 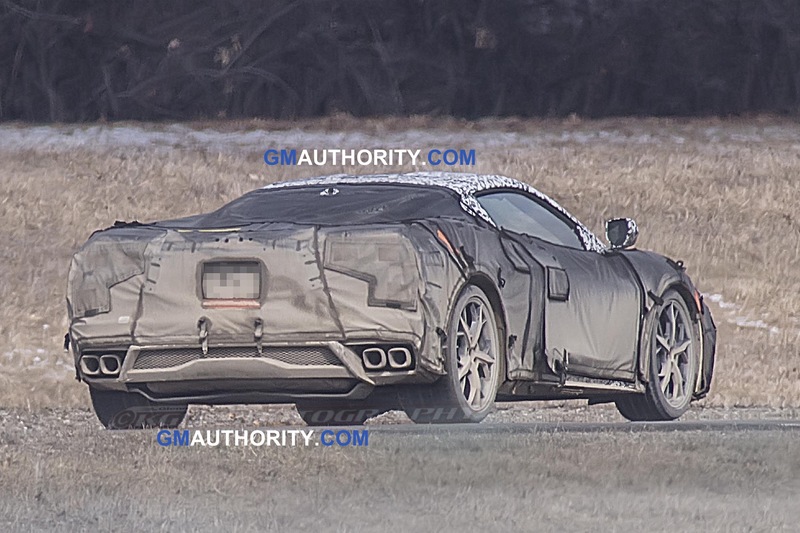 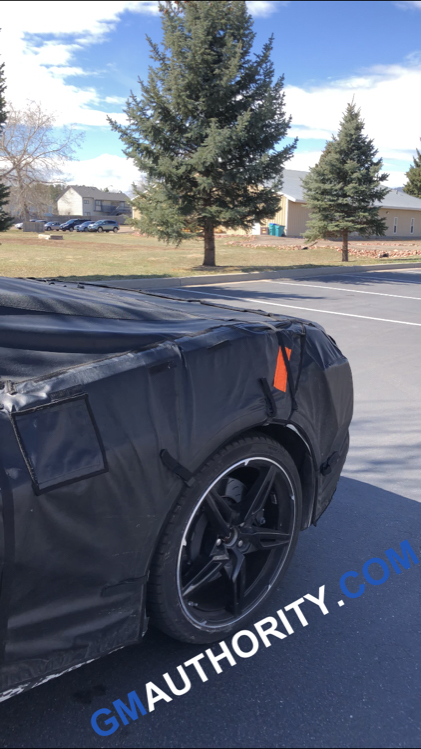 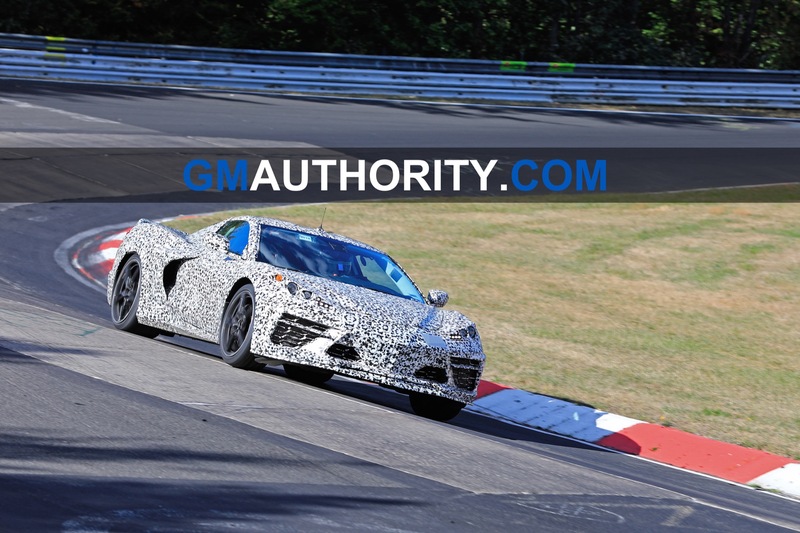 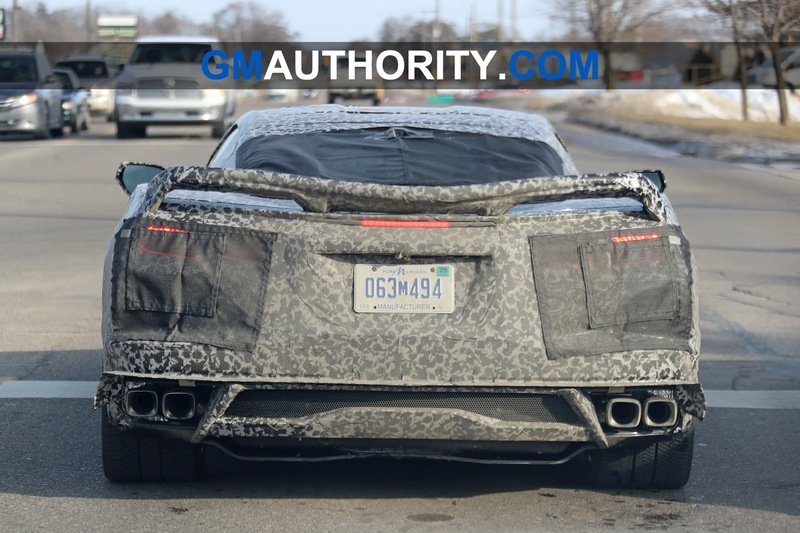 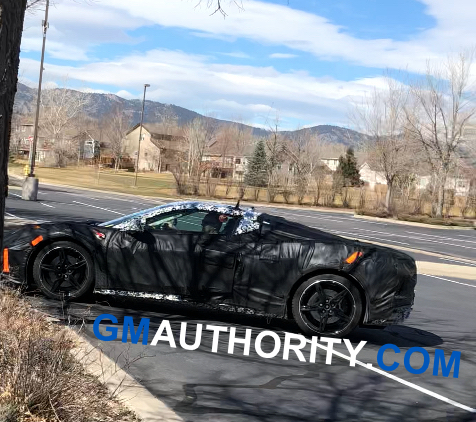 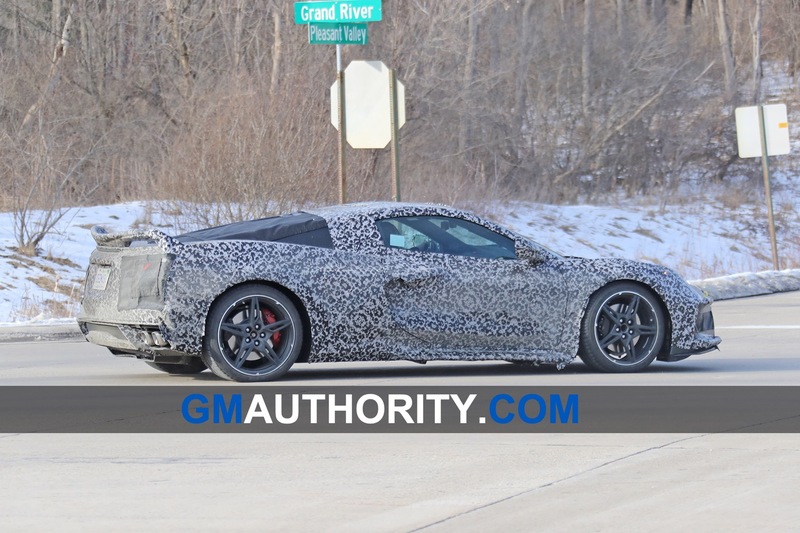 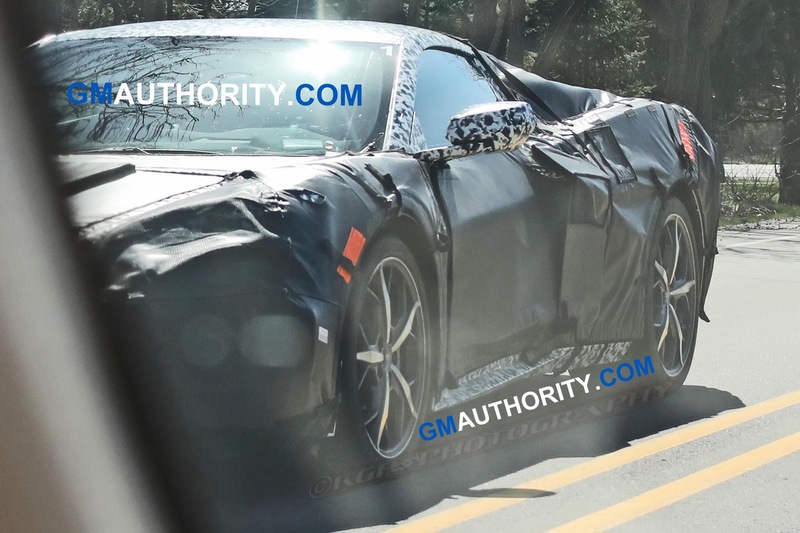 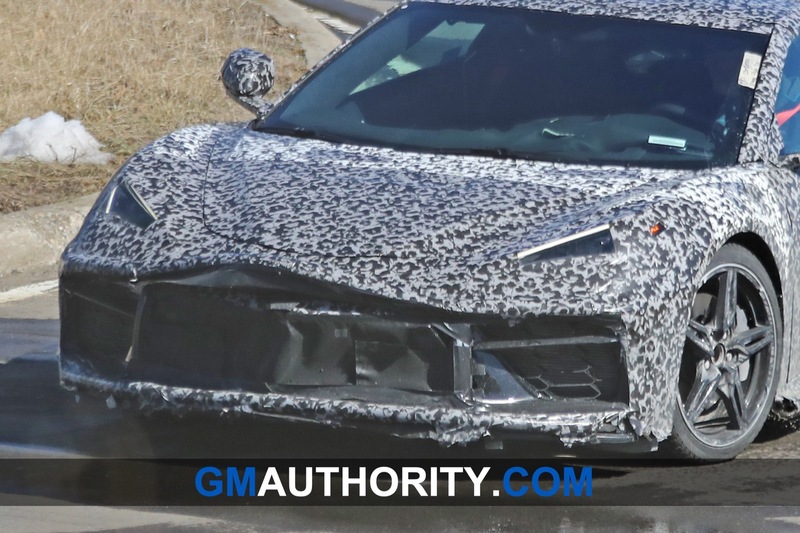 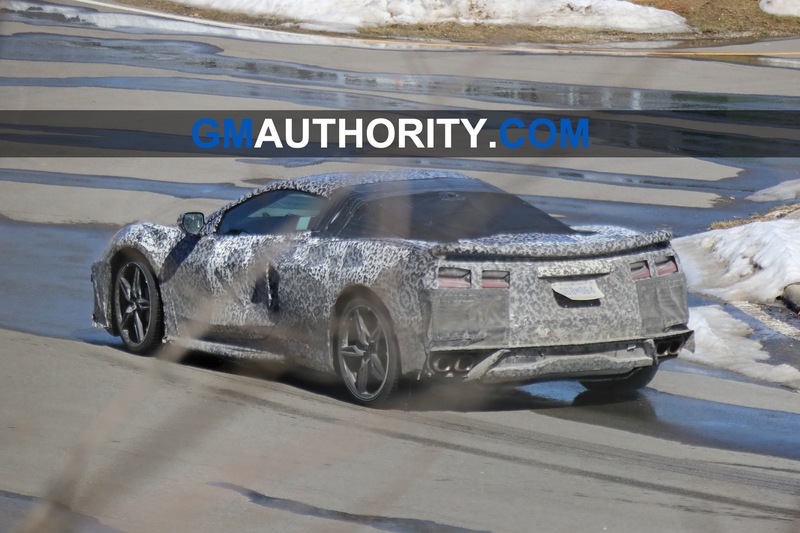 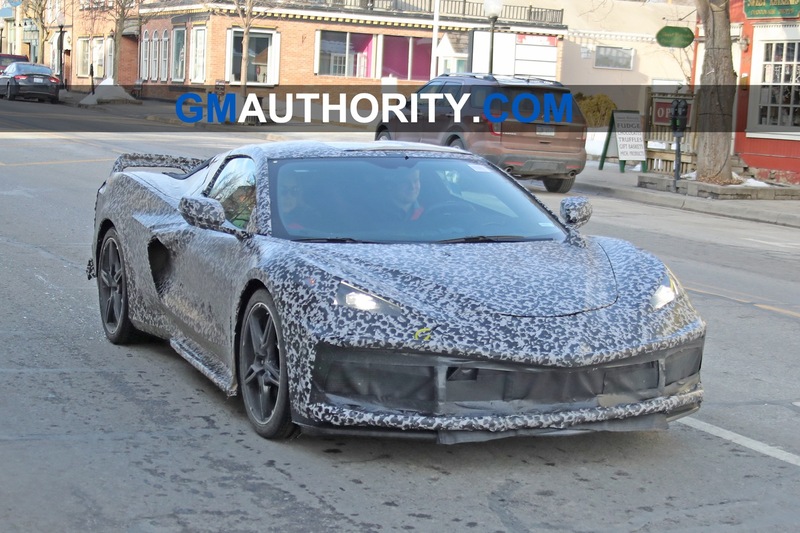 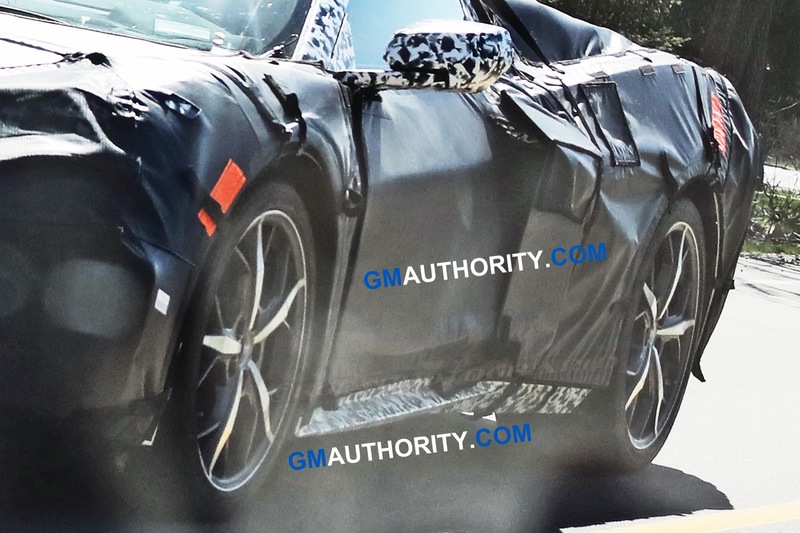 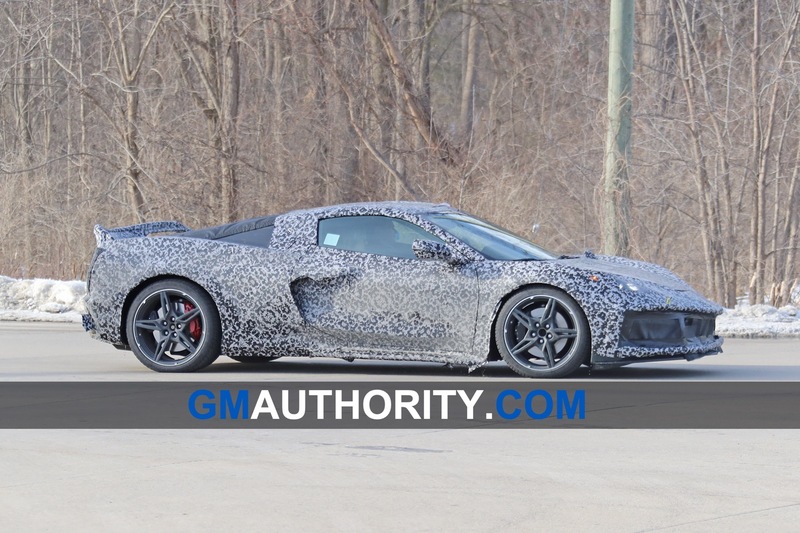 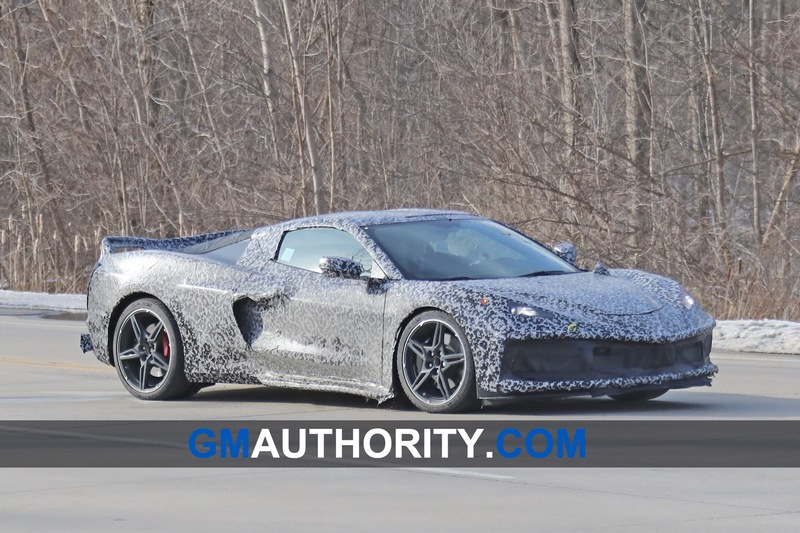 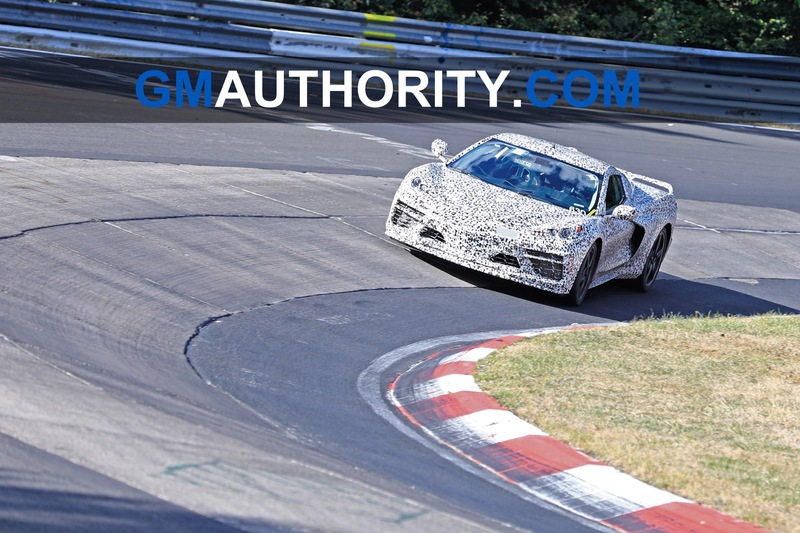 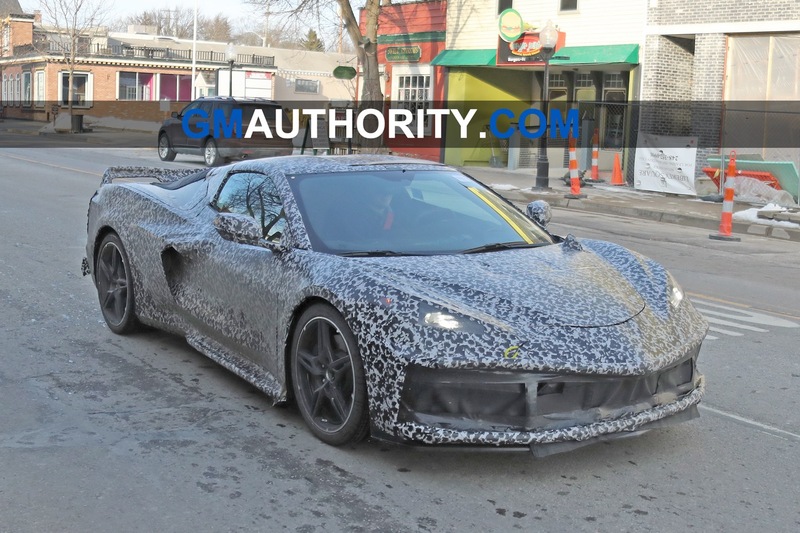 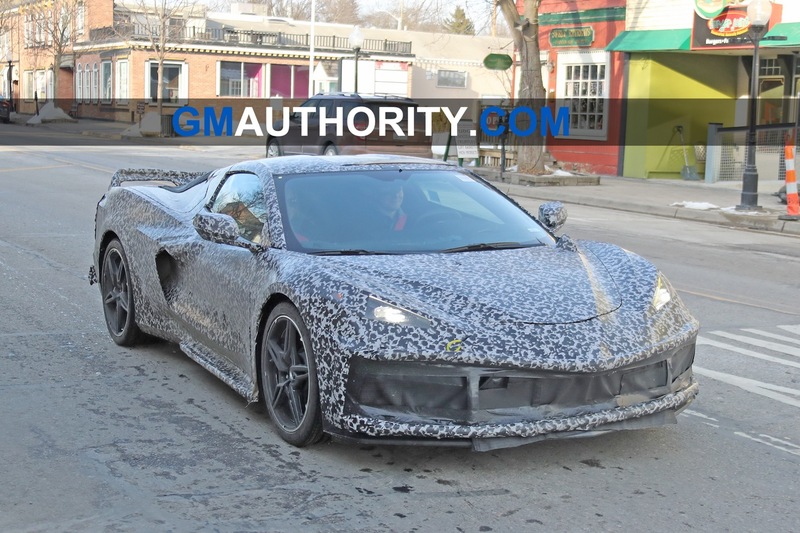 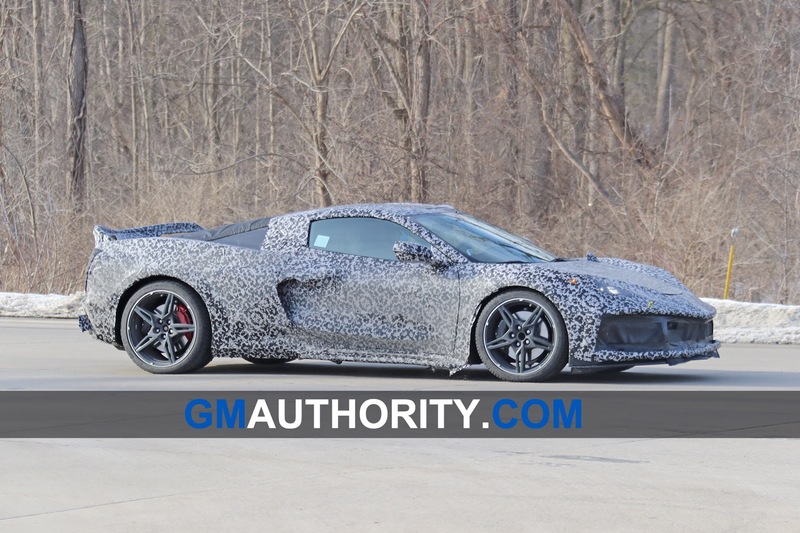 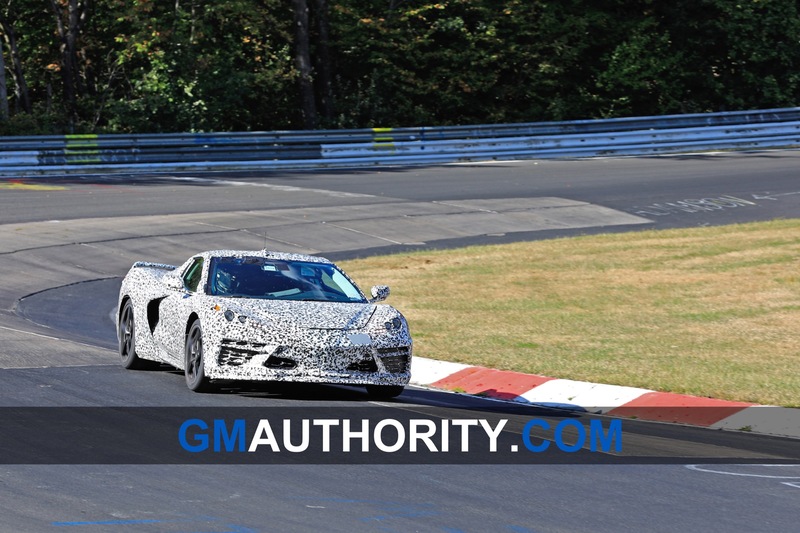 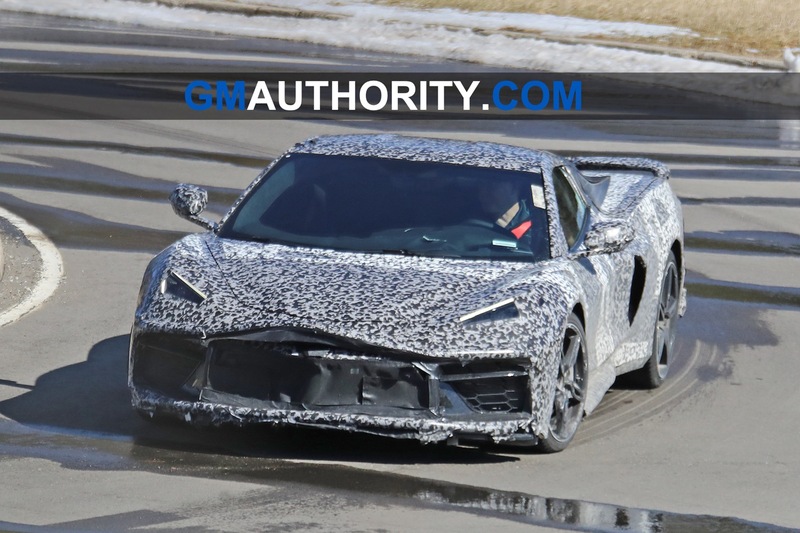 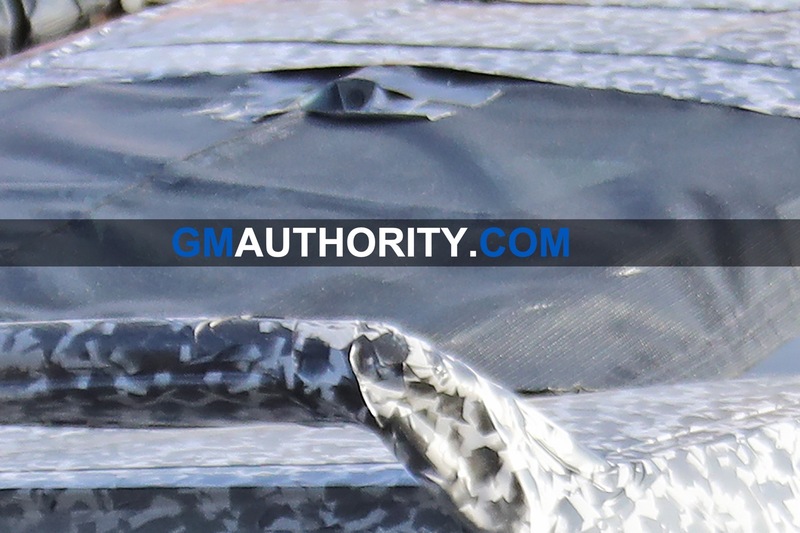 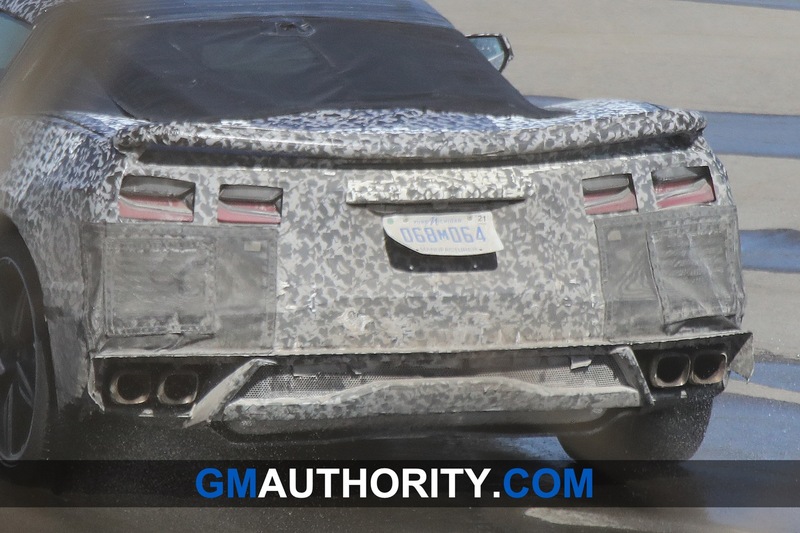 Chevy’s upcoming mid-engine Corvette C8 has been spied testing in the wild for a while now, enabling us to see the upcoming sports car from all angles, in action on the track, while being towed, and even parts of its interior. 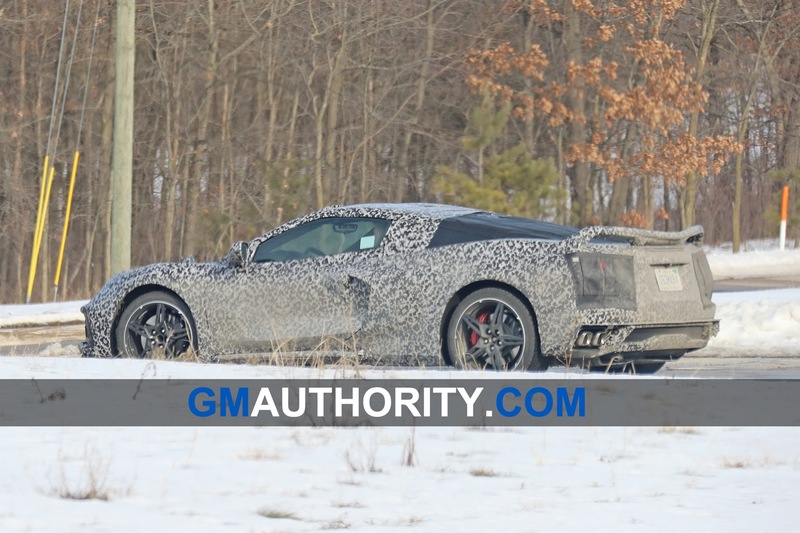 Under all that camo is undoubtedly the best Vette ever. 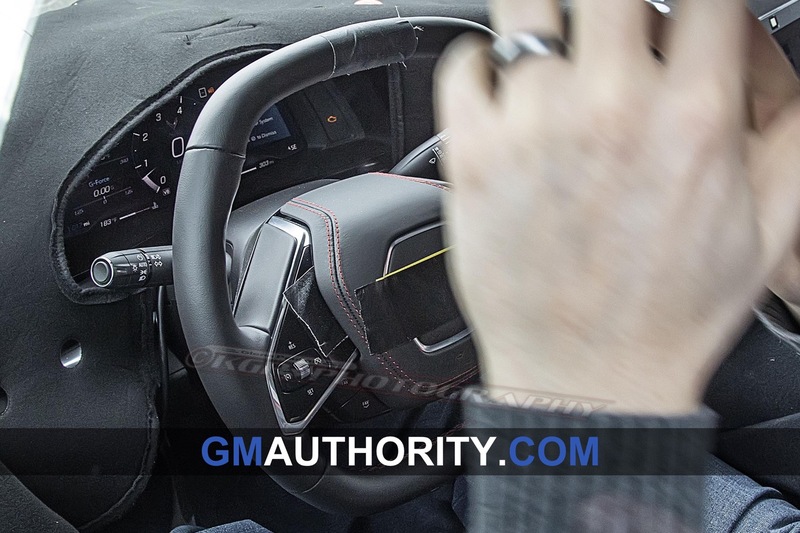 So while we wait with bated breath for the official reveal, let’s take a closer look at the Corvette C8 steering wheel, which we recently managed to get detailed photos of. 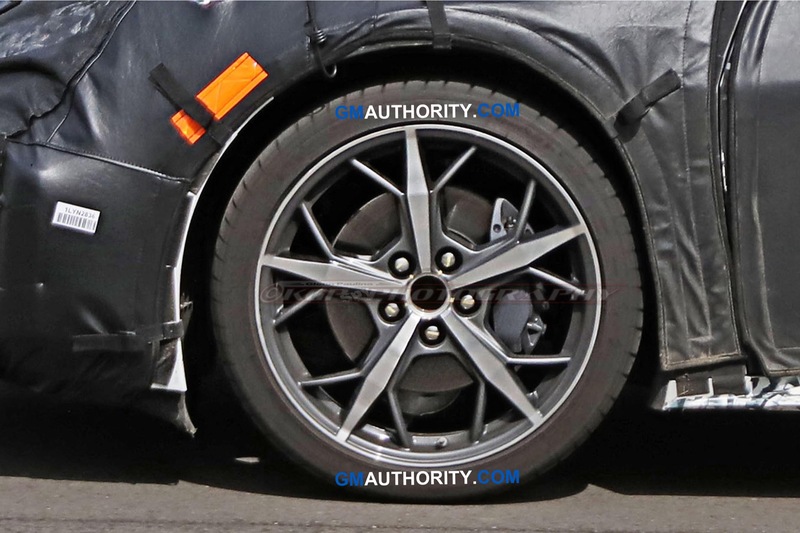 First up is the shape of the wheel. 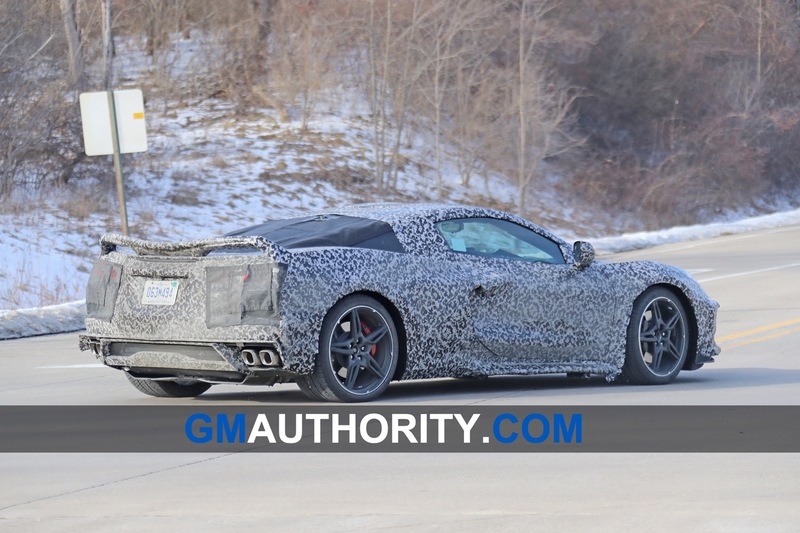 As we noticed before, the Corvette C8 steering wheel has a flat top and bottom that should result in a sportier feel. 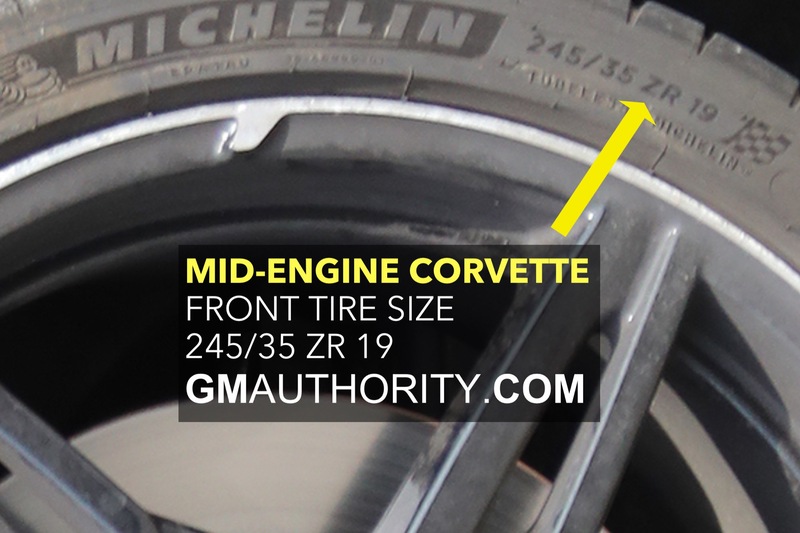 The shape doesn’t necessarily have a functional element, but it does make it easier to maneuver quicker than a wheel that’s more round. 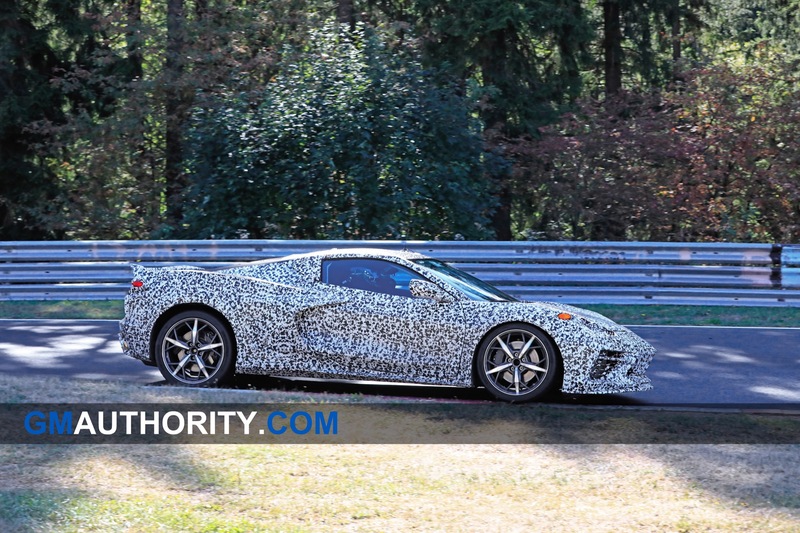 The Corvette C8 steering wheel has two spokes – one at the 4 o’clock position, and the other at the 8 o’clock mark. 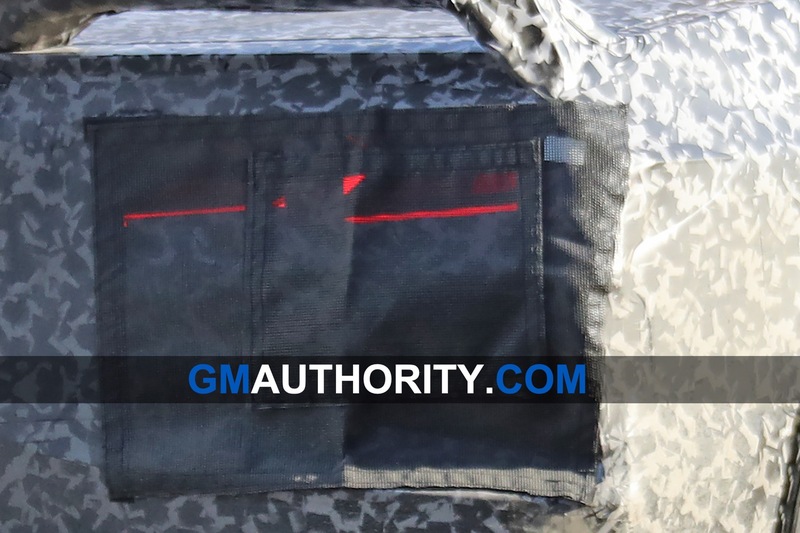 The middle section has tasteful red stitching around the soft/leather-wrapped airbag panel. 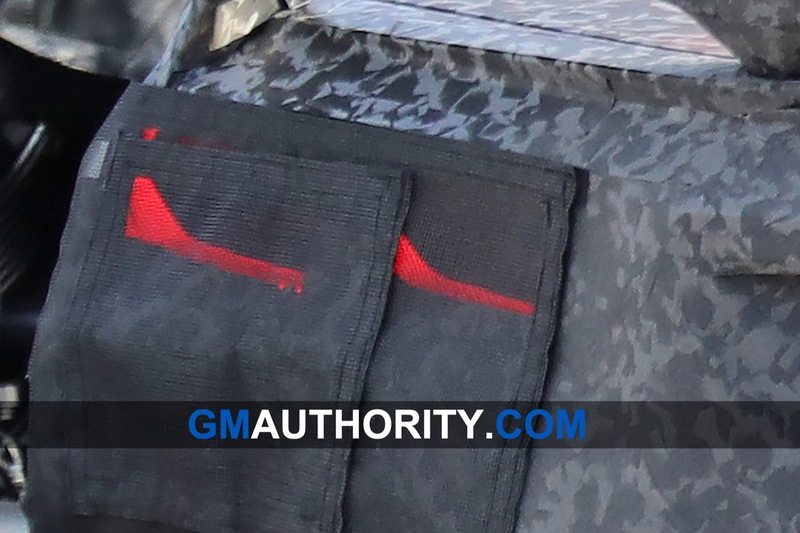 That stitching runs around the inside circumference of the wheel, and matches nicely with those red seatbelts we noticed last month. 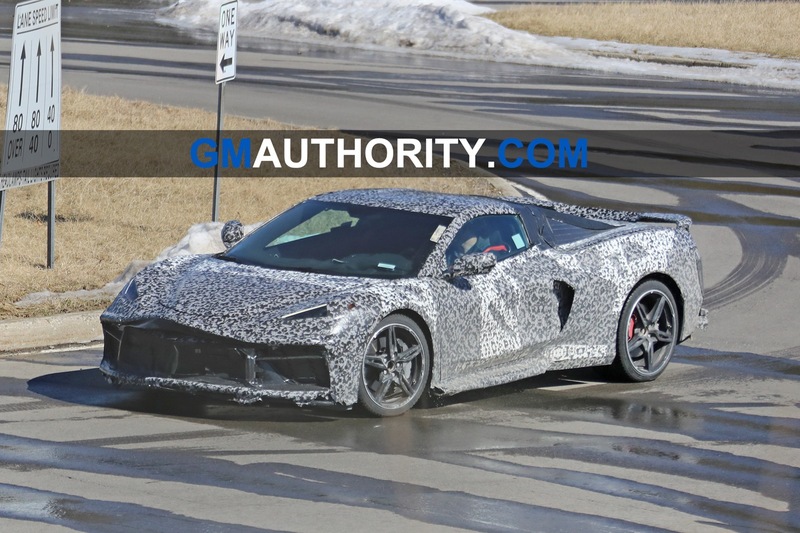 And though the center of the steering wheel is covered by tape, we know full well that it’s hiding the latest iteration of the Corvette logo. 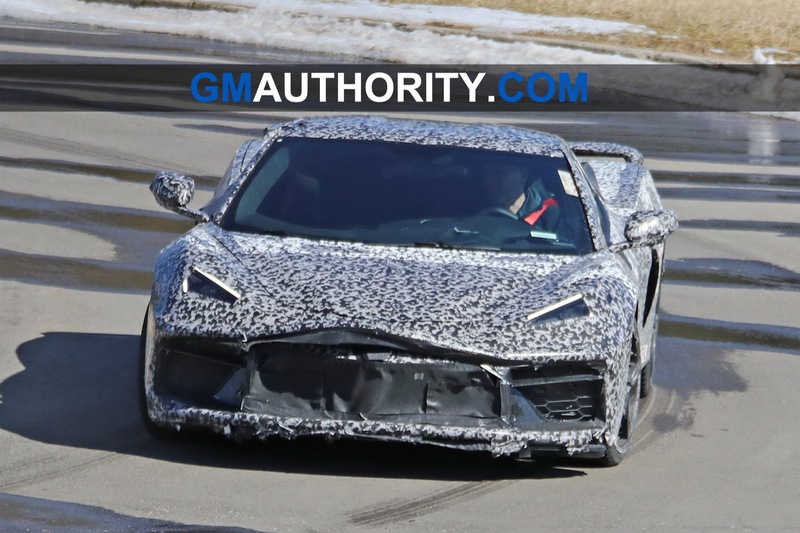 There are also tasteful flashes of aluminum (surrounding the logo) and glossy black finishes (for the buttons and area around the buttons), giving the Corvette C8 steering wheel a rather high-tech and tasteful appearance with high levels of functionality, to boot. 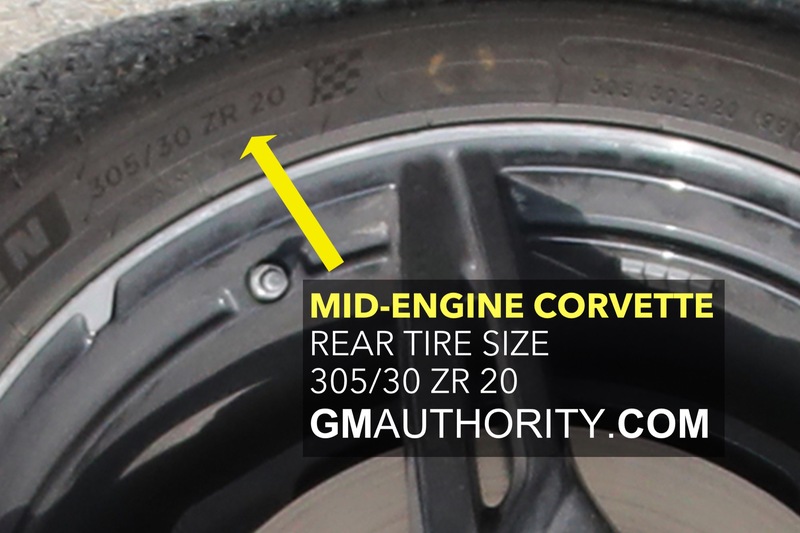 The controls on the right-hand side of the wheel are organized into two sections. 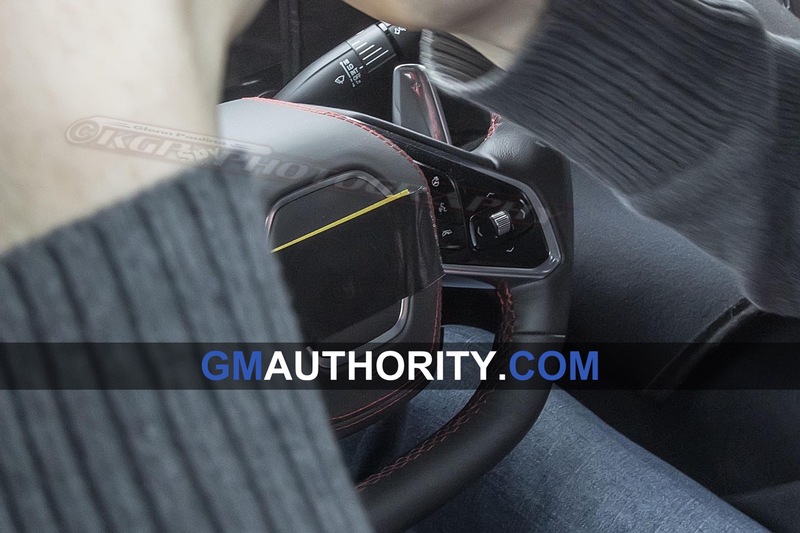 The part closest to the center of the wheel starts off with a heated steering wheel switch at the top for those chilly winter days. 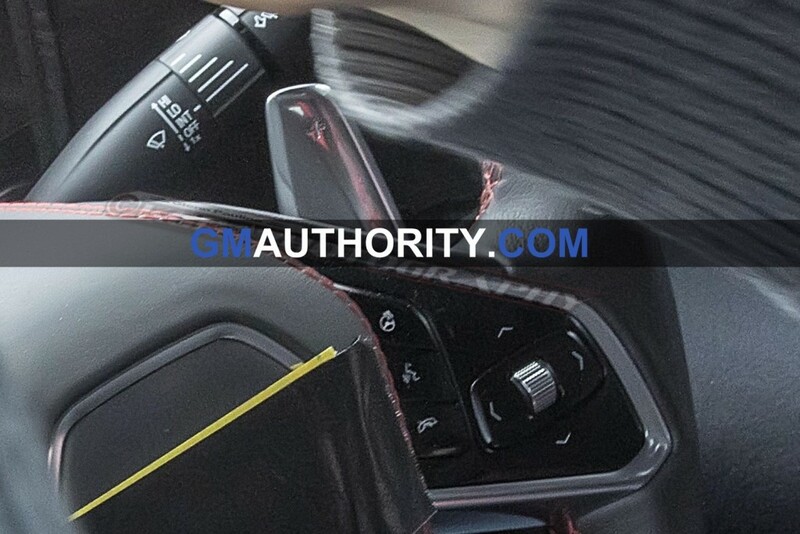 Just below it is the voice command button that will likely continue integration with the Chevrolet Infotainment System (née MyLink), Apple CarPlay, and Android Auto. 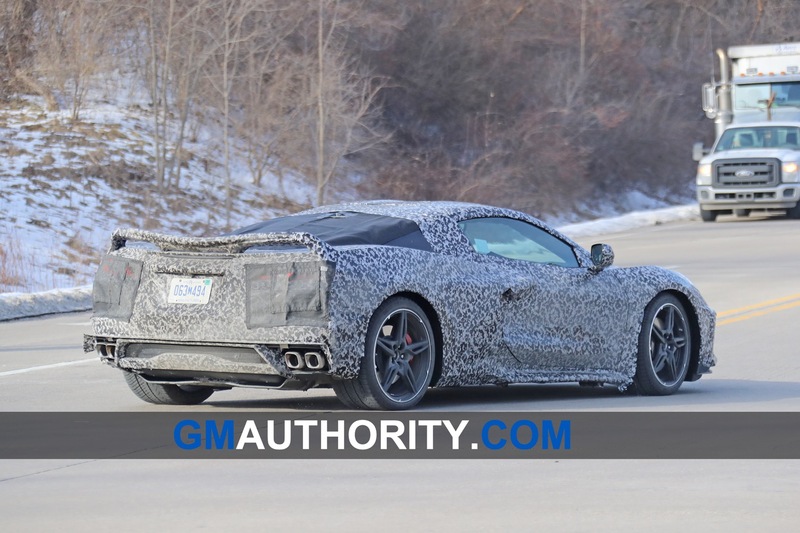 At the very bottom of the Corvette C8 steering wheel sits an end call button. 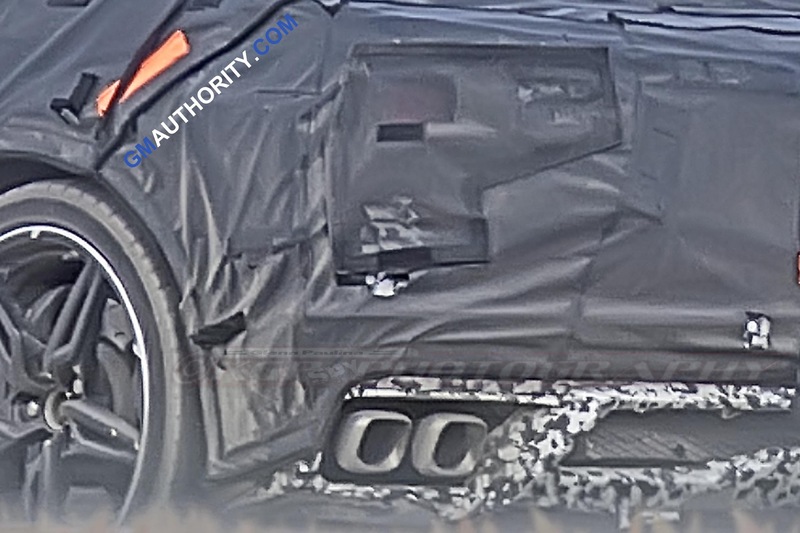 On the outside portion is a chrome scroll wheel to control the audio volume. 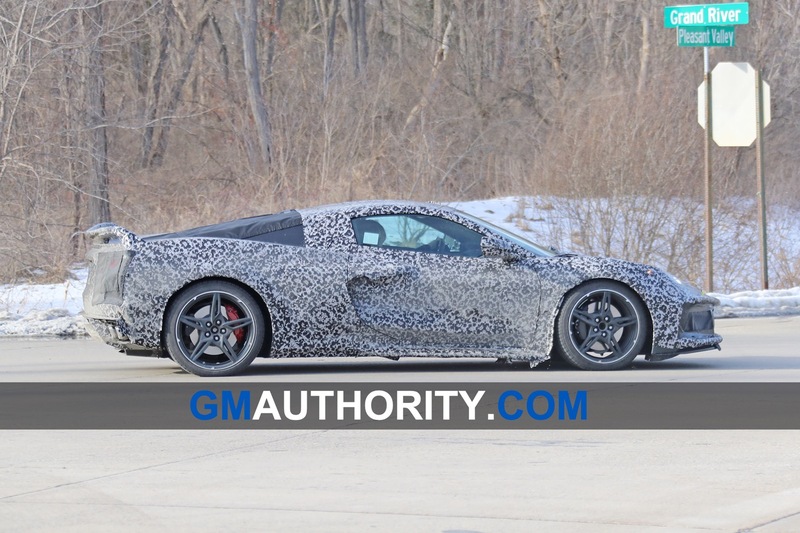 Surrounding it is a multi-directions D-pad to control that digital gauge cluster. 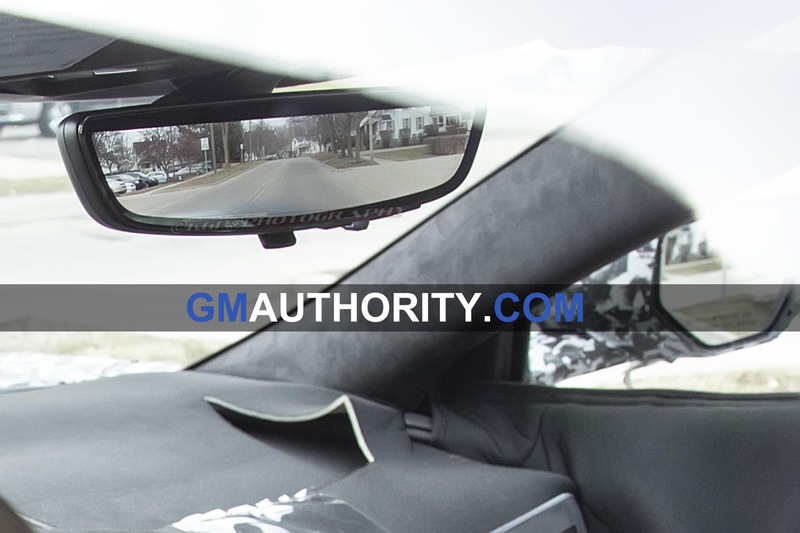 We believe that the scroll wheel will also double as a “push selector” to select an item on the gauge cluster. 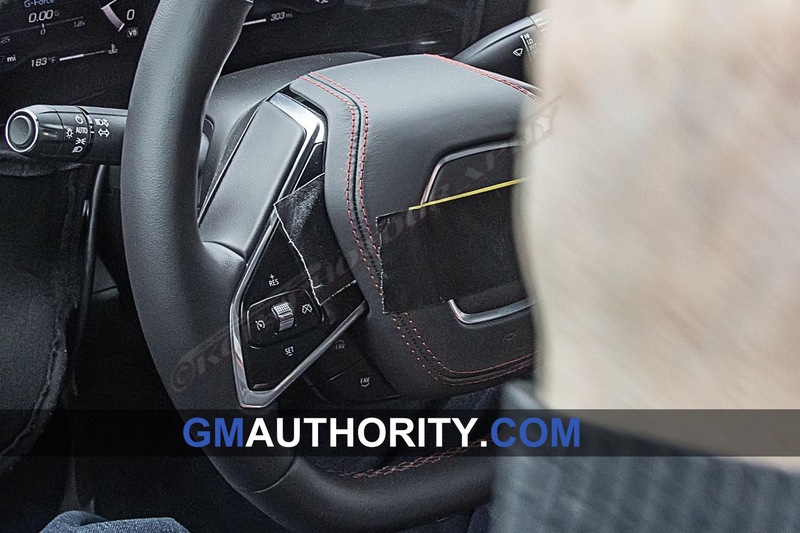 Answering a call will probably be completed by pushing this chrome selector on the “answer” soft button in the gauge cluster when a call comes in. 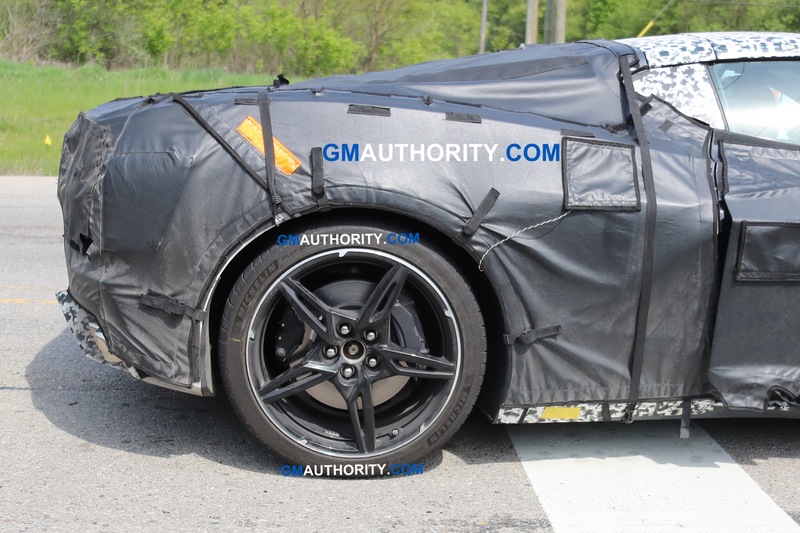 There are also two buttons beneath that section mounted on the inside of the wheel, but we can’t make them out from these photos. 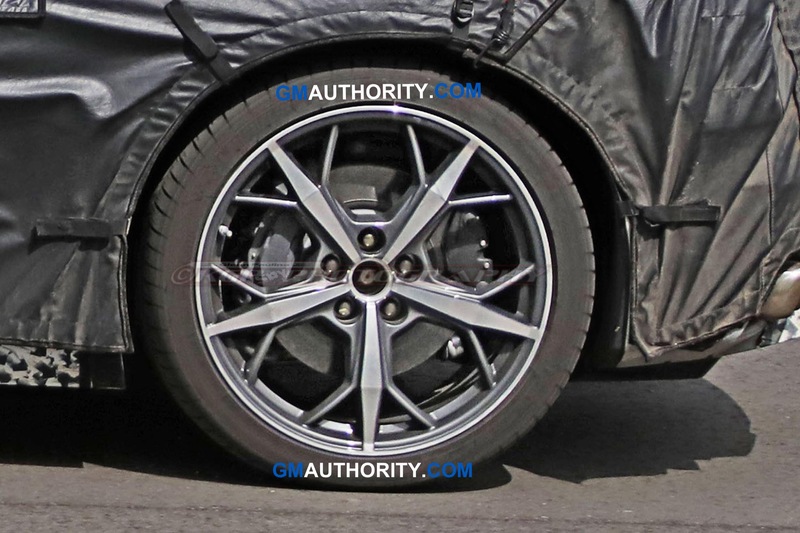 These have a set of twin buttons on the left side of the wheel. 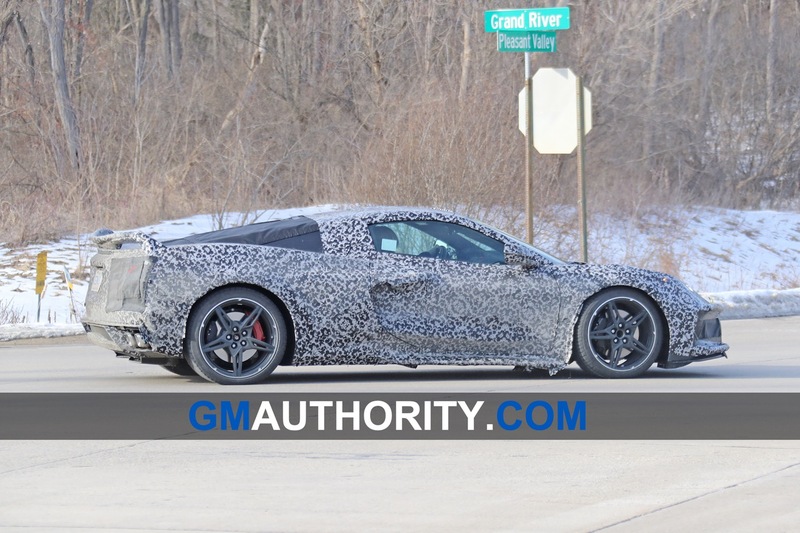 On the left-hand side of the Corvette C8 steering wheel, we see controls for cruise control, with a chrome up/down toggle (identical to the volume toggle on the right-hand side of the wheel) to raise or lower the cruising speed. 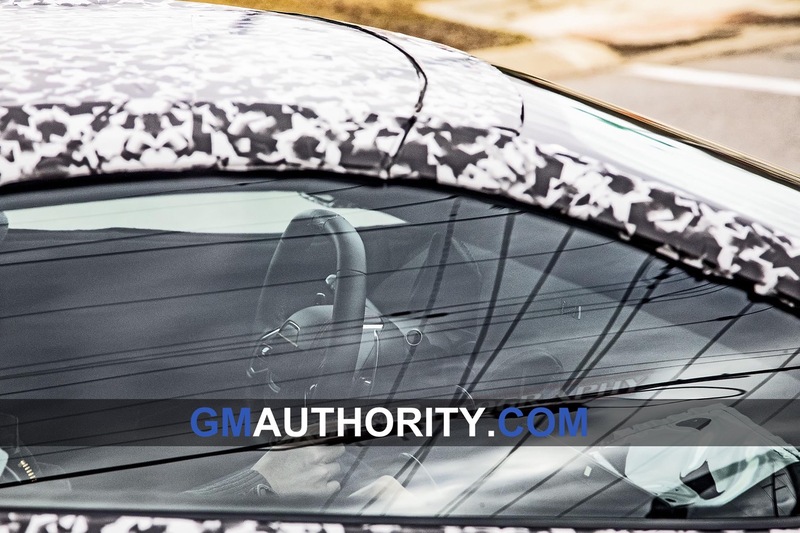 Interestingly, the inside portion of the steering wheel is taped up. We would expect that section to have buttons to control following distance and other items related to cruise control. 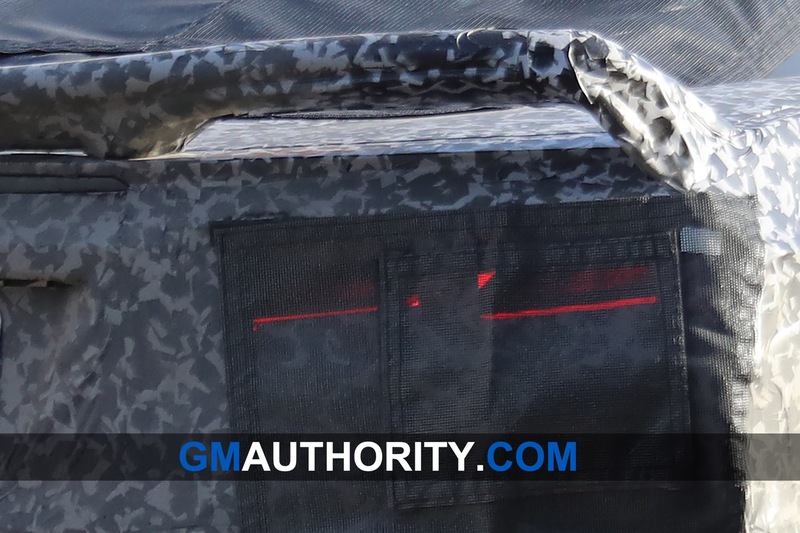 Beneath those live two buttons to control favorites/presents. 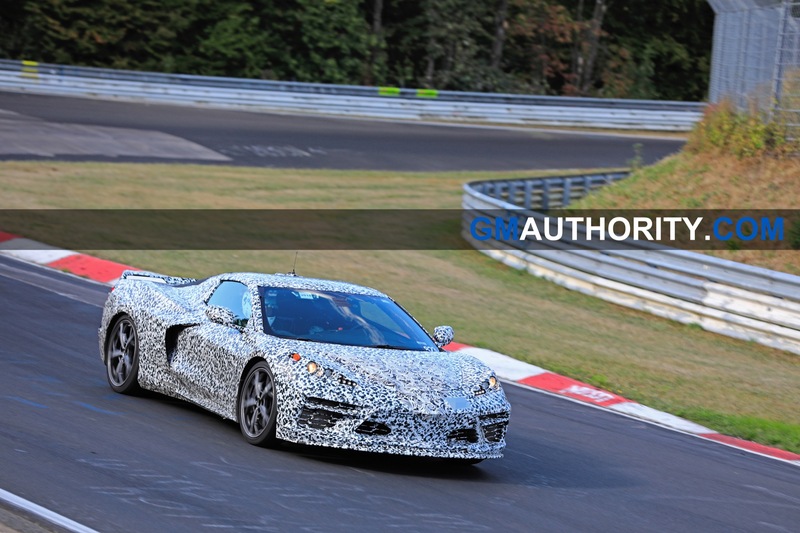 Behind the wheel is a set of large paddle shifters. 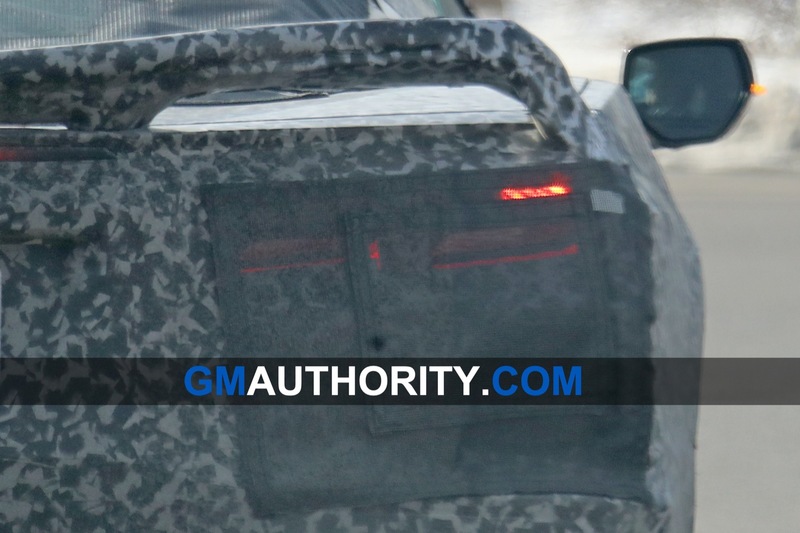 These are nice aluminum-looking units, although they could also be magnesium like in some Cadillac models. 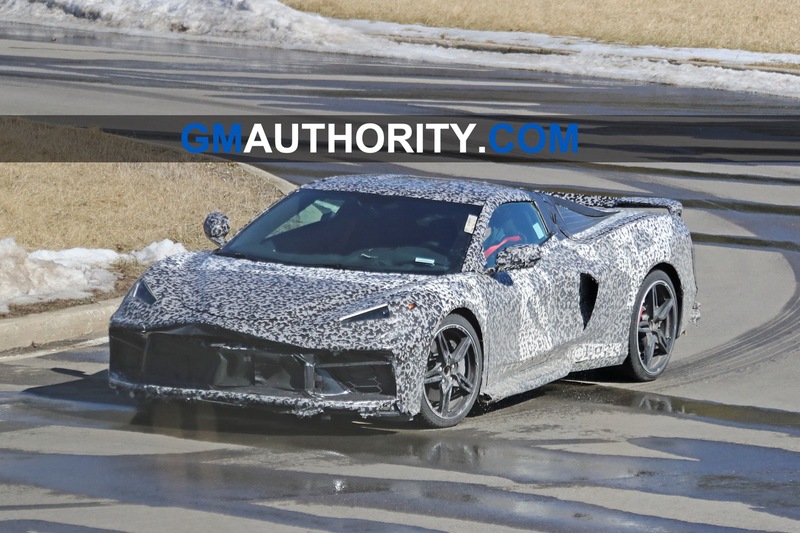 What transmission these paddles will control is still a mystery, but the latest rumor has it that the mid-Engine Corvette will use a double-clutch gearbox from ZF. 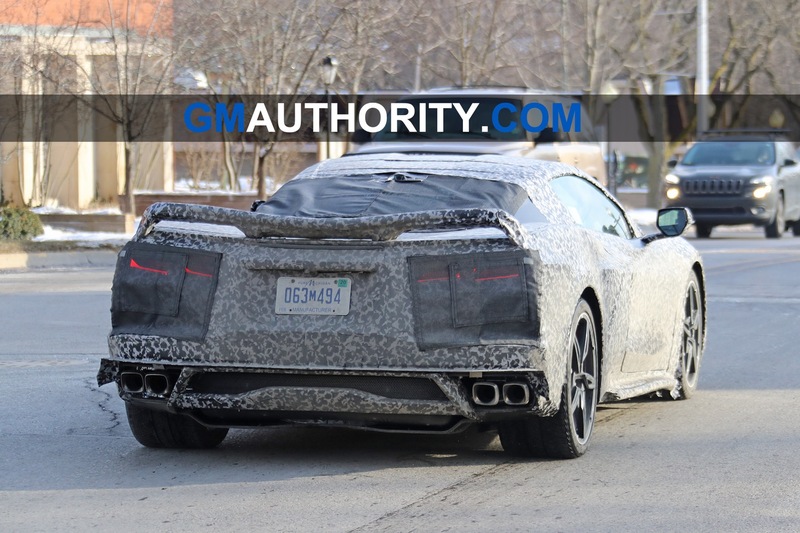 A manual transmission is not expected to be part of the lineup. 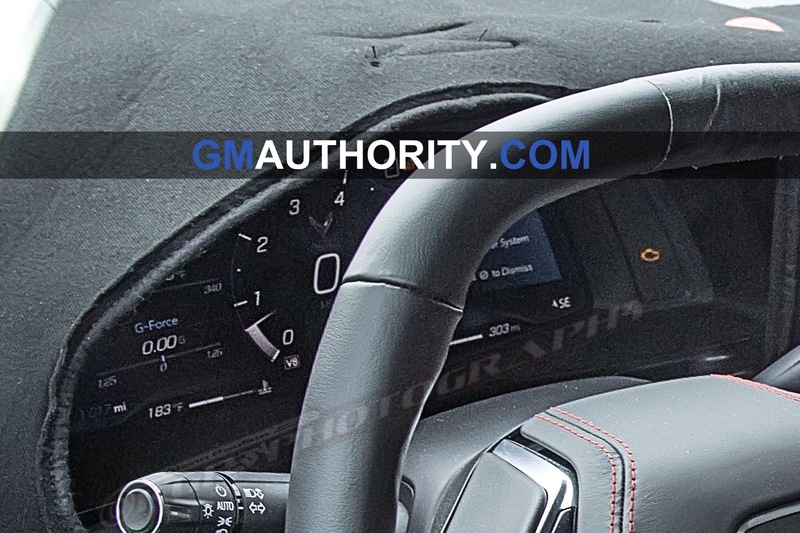 We should also note that the 12 o’clock section of the steering wheel has black tape on it, making us wonder whether it has a 12 clock position line. 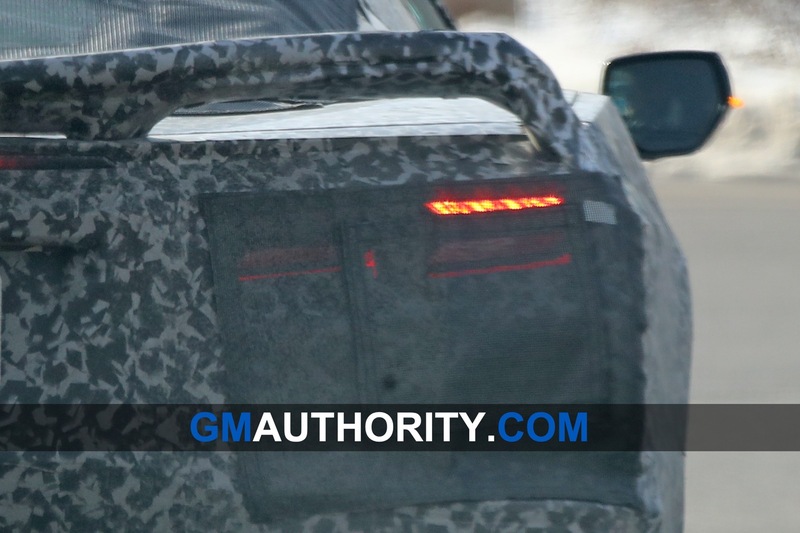 This element in red would go really well with the other red elements in the cabin. 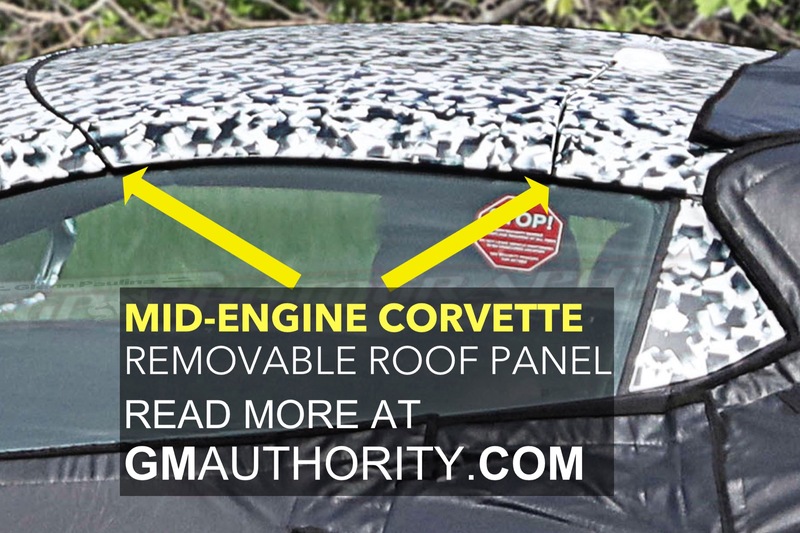 Subscribe to GM Authority (for free) for the latest Corvette news, Corvette C8 news and mid-engine Corvette news. 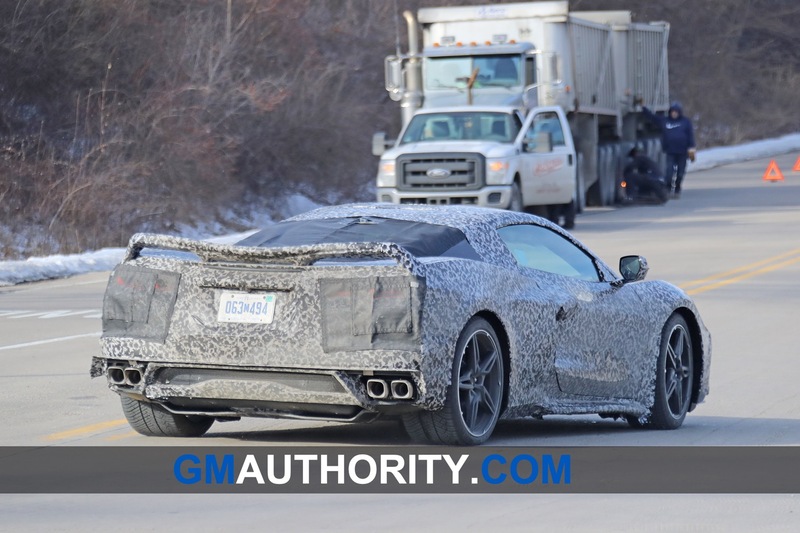 I’m not so sure about your guess for the volume control. 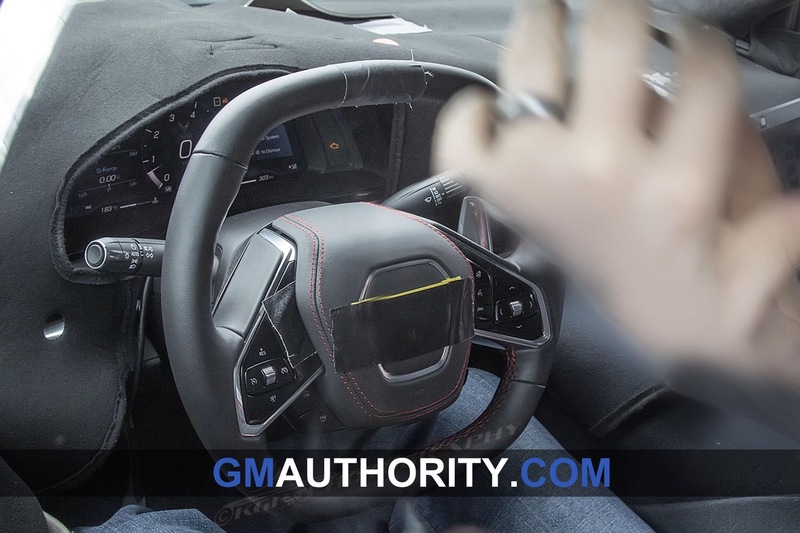 The current Camaro steering wheel, which is essentially the C7 wheel, has the Fav/Preset buttons mirrored on the right side of the steering wheel, and those are used for volume control. I would assume that they would do the same thing here for the C8 wheel, and that the center portion of the steering wheel in this pic is just blocking us from seeing those two buttons on the right side. 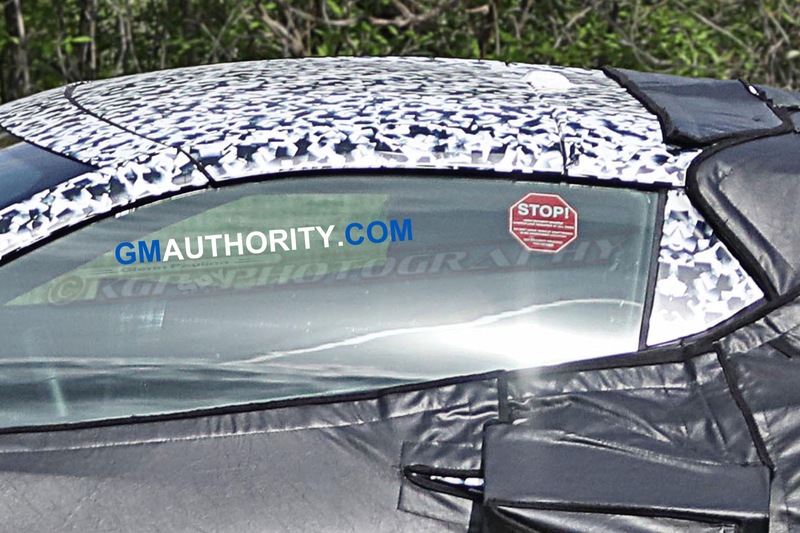 I believe that the chrome scroll wheel on the right side would function similar to the scroll wheel on the current Sierra and Silverado…just scrolling up and down through the options and clicking in to select. 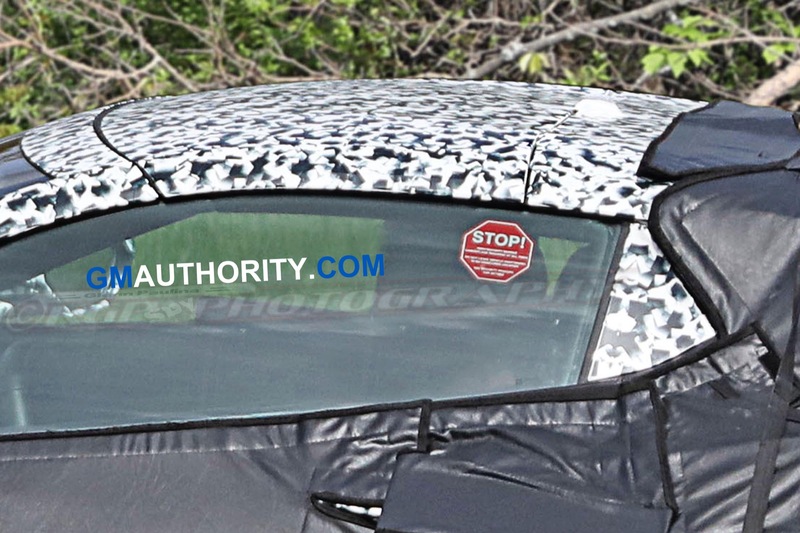 I hope that’s not the case since I’ve heard some people find that weird that up and down arrows don’t actually click while the right and left arrows do. 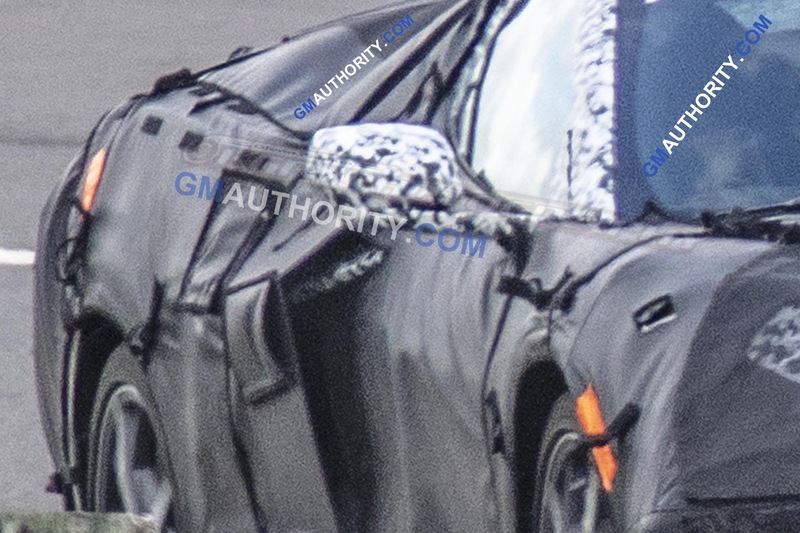 I can’t confirm if that’s the case though since I haven’t messed with the buttons on a current Sierra or Silverado. 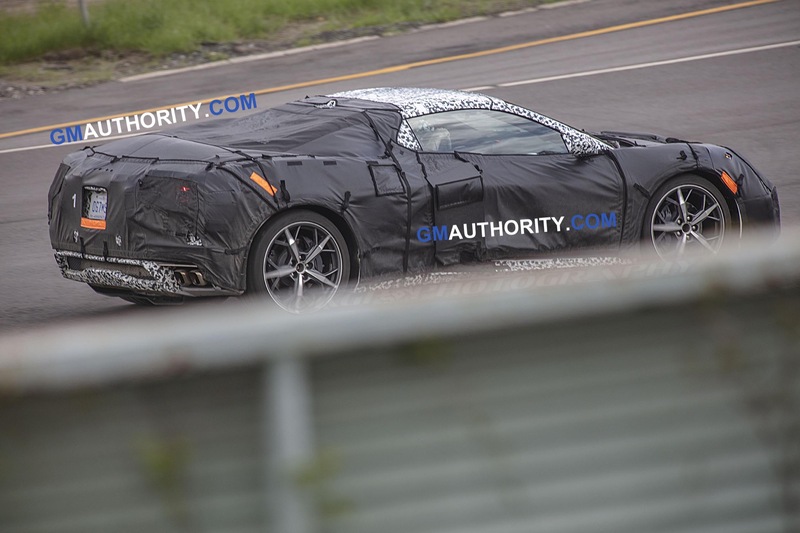 But I’m totally just guessin here about the C8 functionality, and I’ve been plenty wrong before. 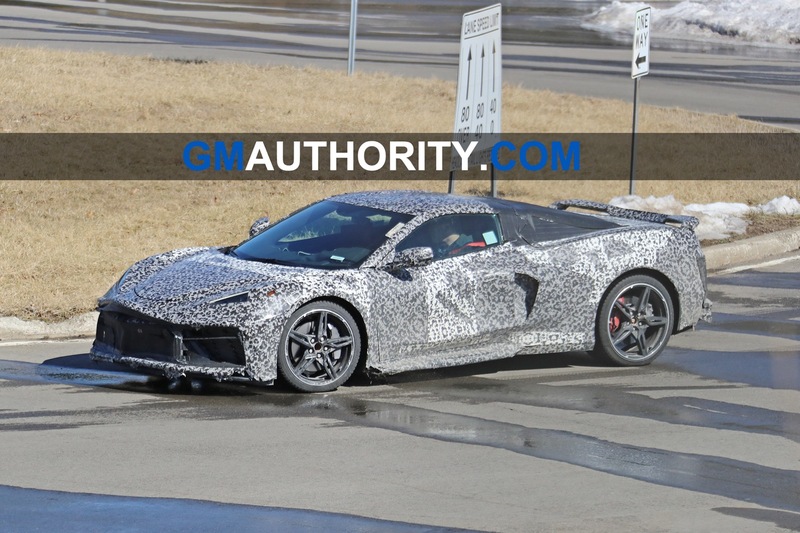 Chevrolet engineers probably were inspired by the design of F1 race cars with the emphasis to try keeping the drivers on the wheel of the car as almost everything the driver needs to drive the car is at his fingertips. 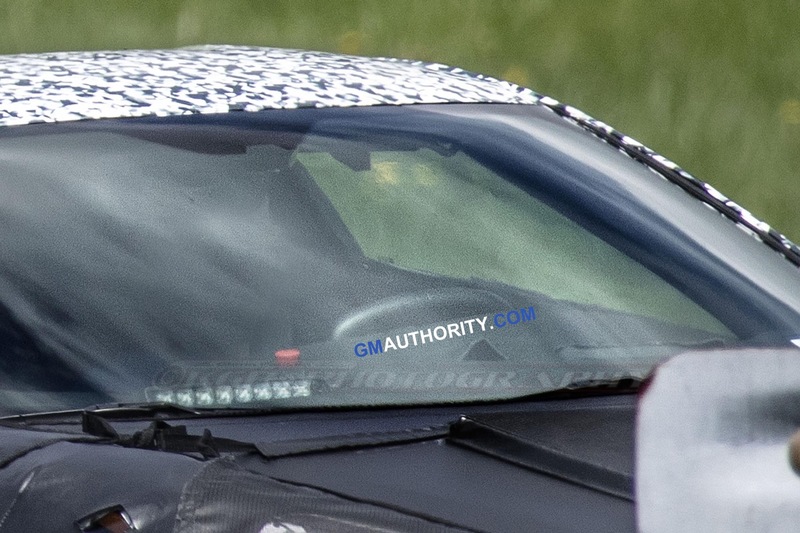 Anyone notice that nifty little logo in the speedo/tach? 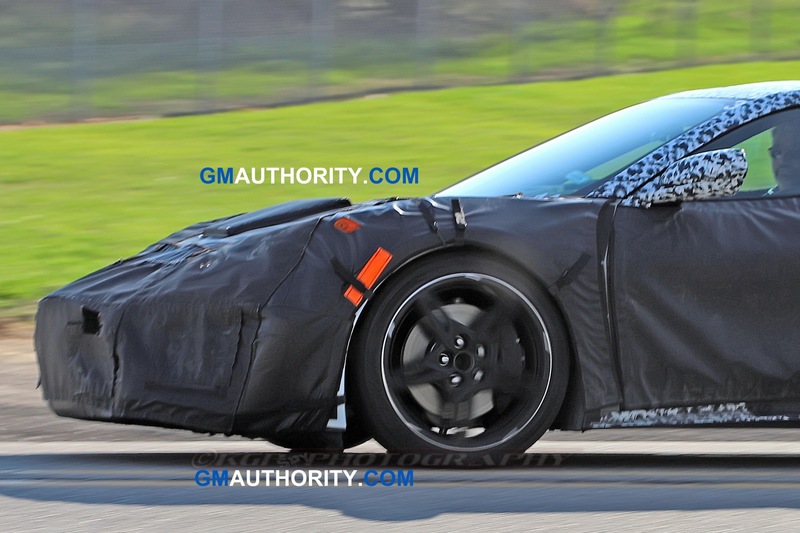 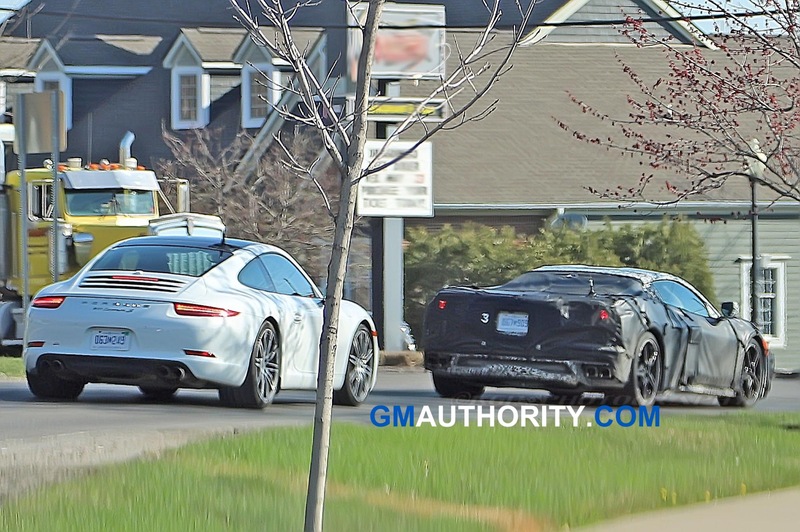 Hmmmm…..first confirmation of what this car really is? 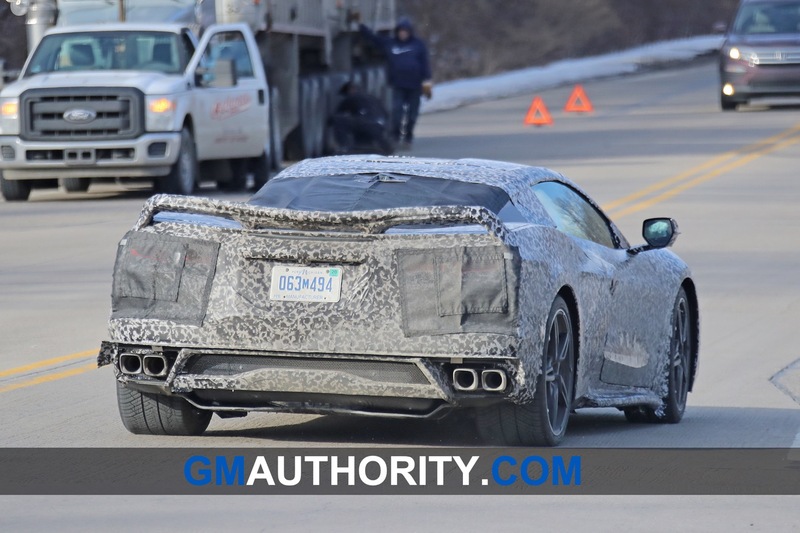 Gees Louise GM. 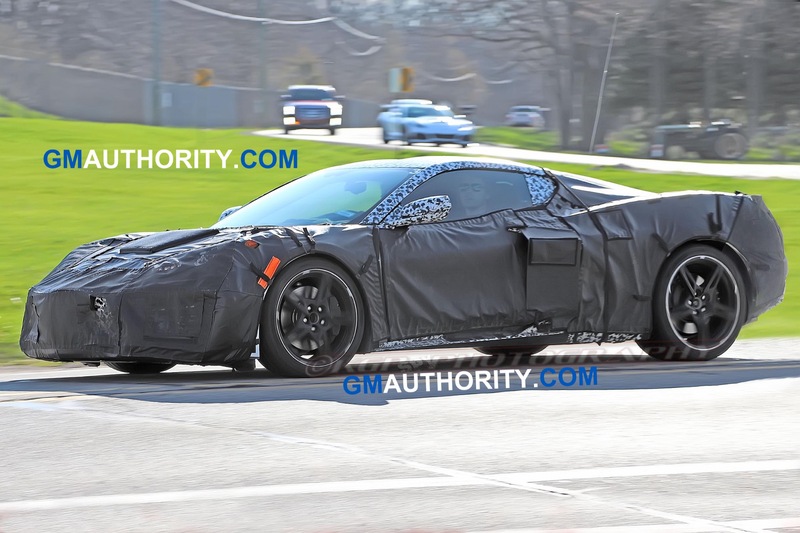 This is meant to be a flagship sports car car, not moms minivan! 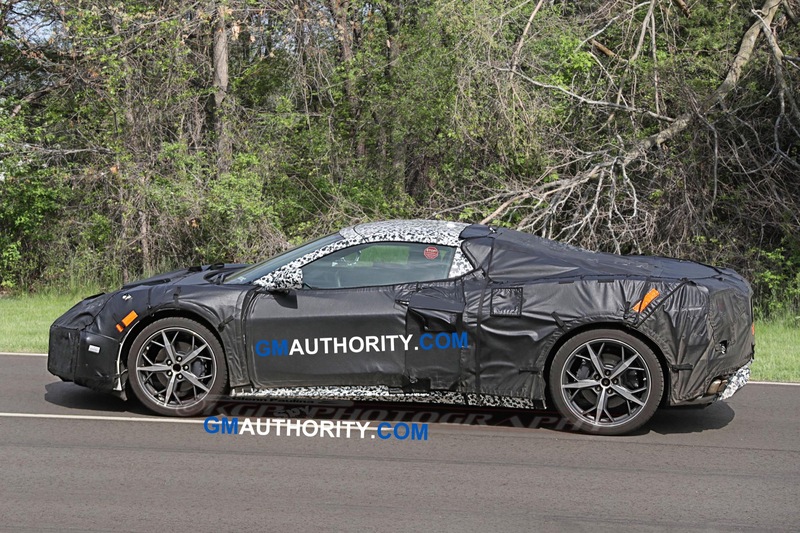 The console looks like a regular old plastic and faux leather generic GM interior. 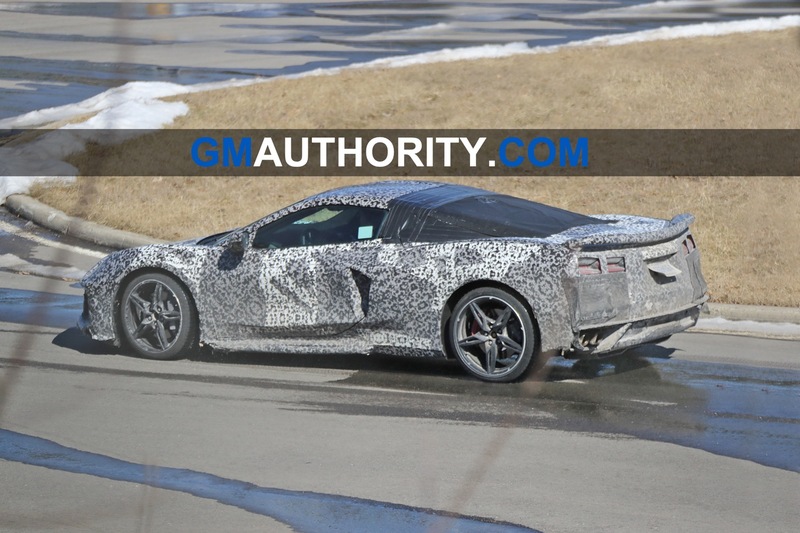 GM PLEASE take a look at a few high end sports cars and get some inspiration! You cannot even see the centre console in any of the shots as they are concealed. 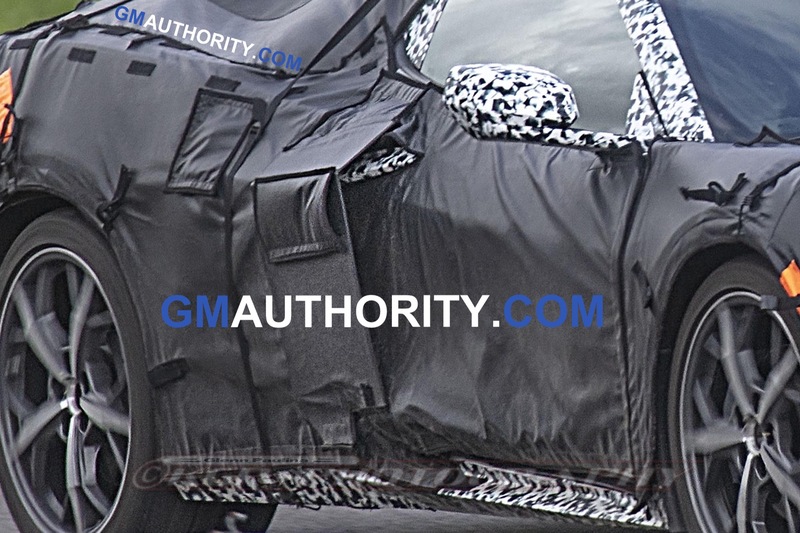 How can you possibly know what it looks like? 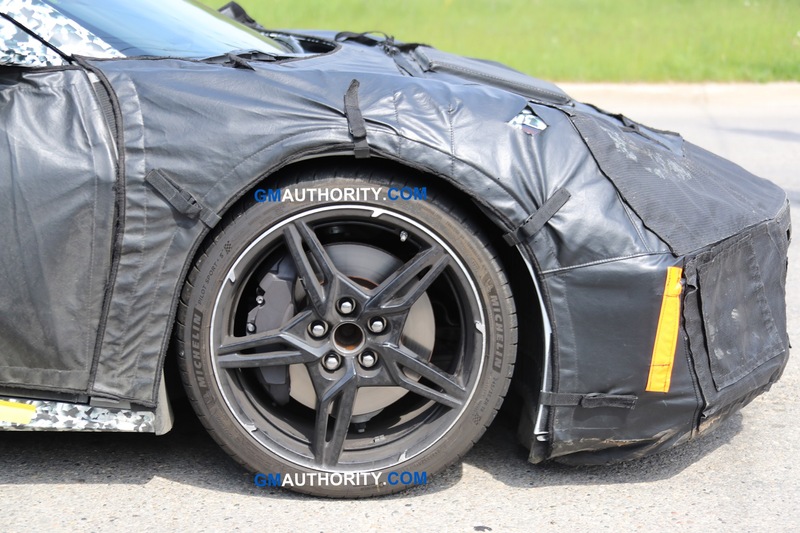 I’m wondering if the tape in the center part at the top of the wheel is hiding the lights for Super Cruise, similar to Cadillac’s steering wheels with that feature. 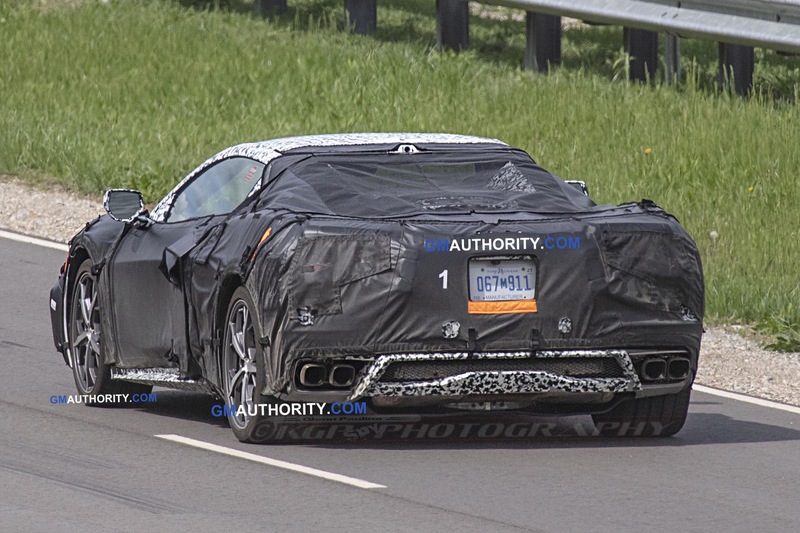 I kind of doubt it since it isn’t nearly as wide as the light bar on the Cadillac wheels. 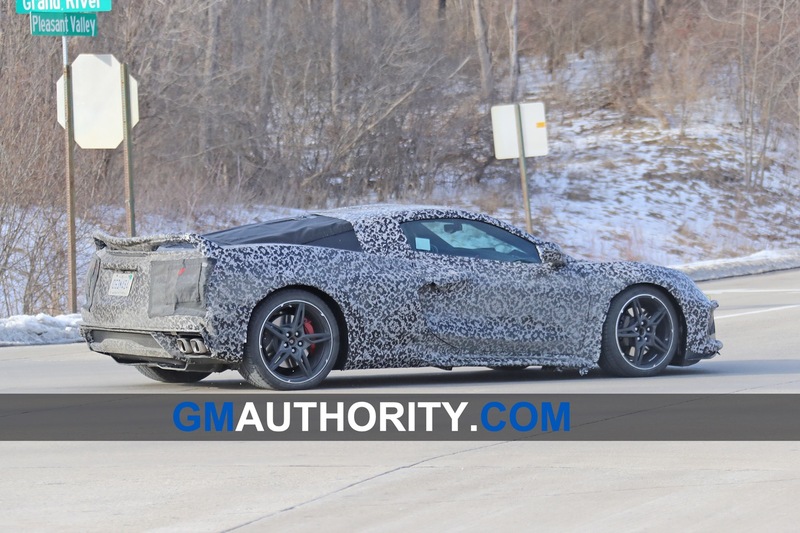 Know I’ll get some feed back, but here it is anyway … Chevy needs to quite worrying about a model that has such a limited customer base and get back to some “meat an potatoes” vehicles. 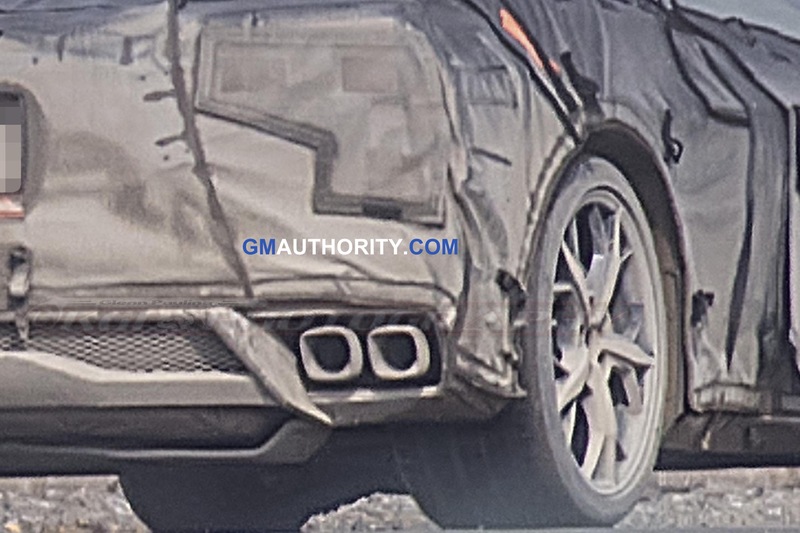 Chevrolet, bring back the Astro and the GMC Safari mid sized vans, or offer a short wheel based full size van like the telephone guys once had. 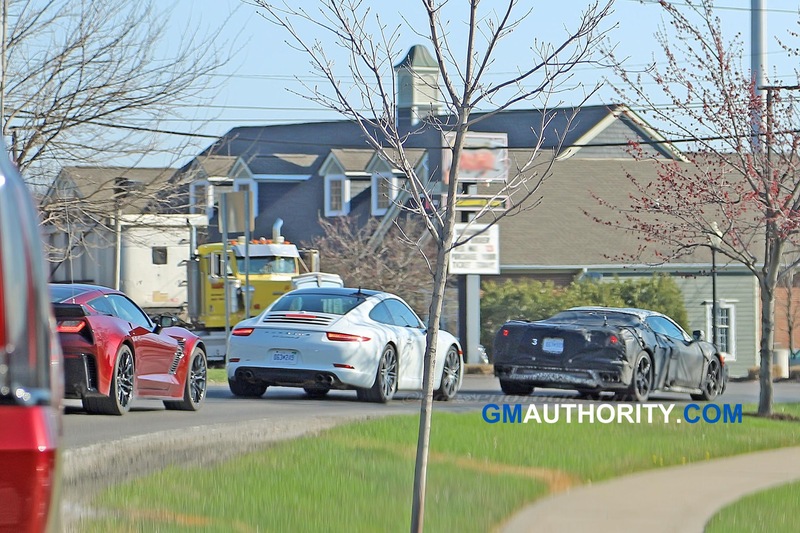 I drove those for decades, plenty of room, power was good, and the resale value was always high. 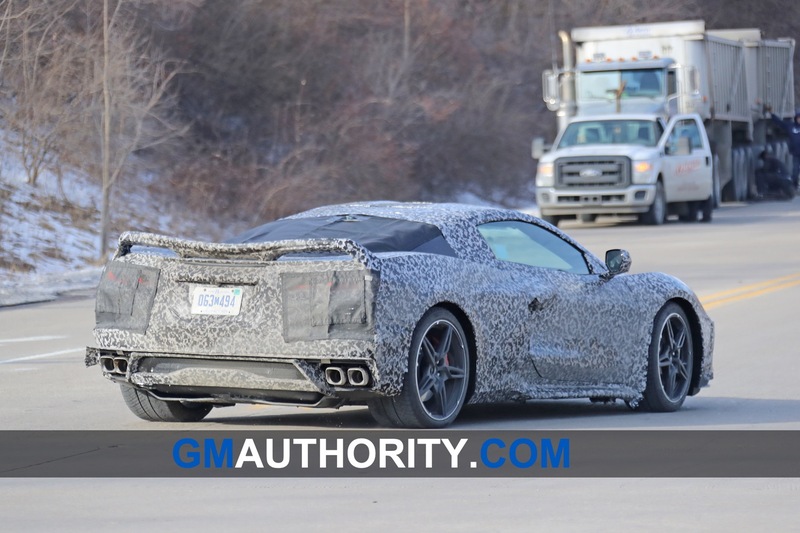 The only thing close today is a Mercedes type of vehicle, so GM get back to what made you great.